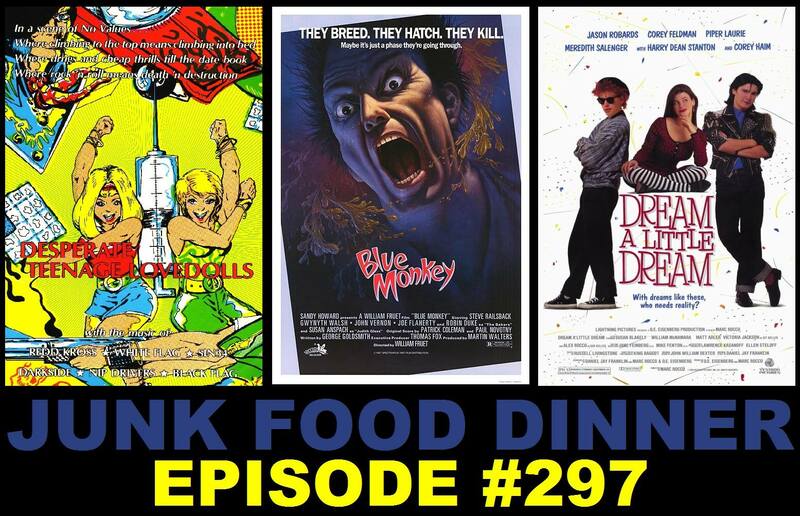 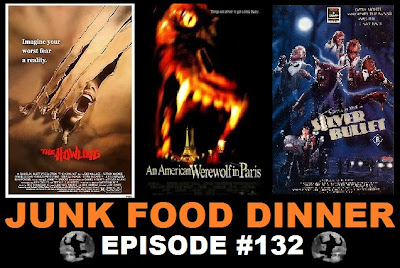 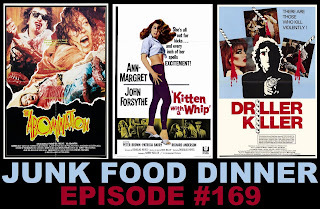 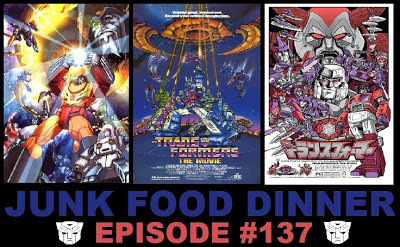 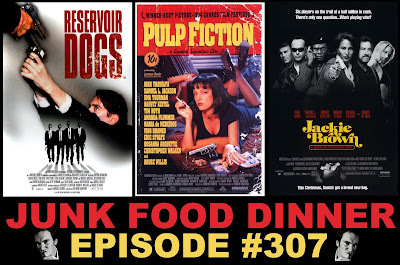 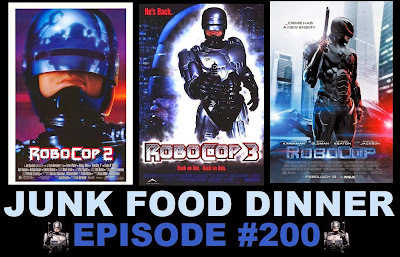 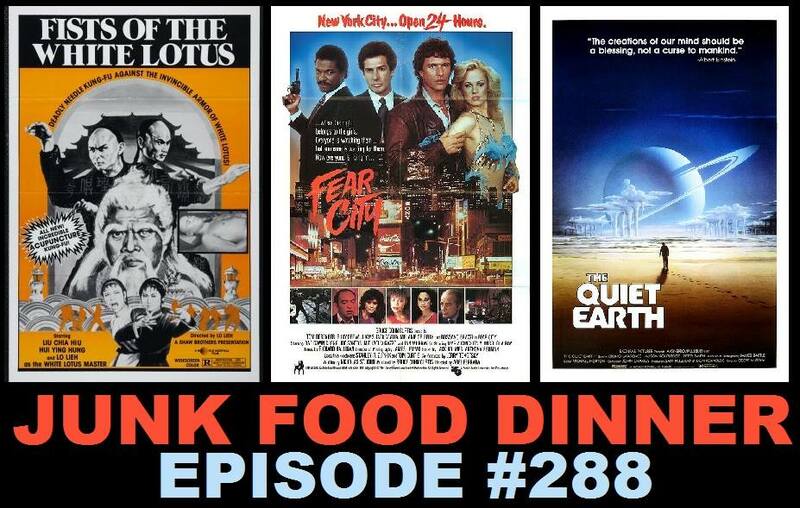 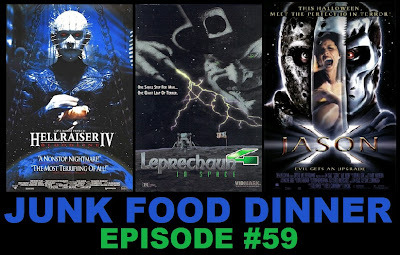 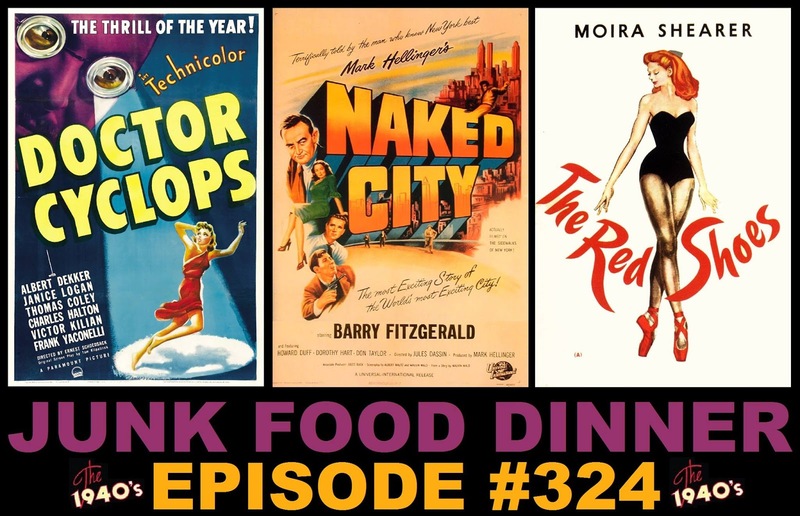 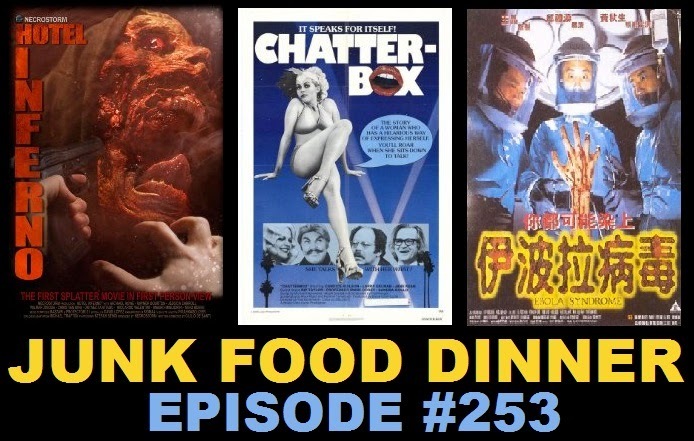 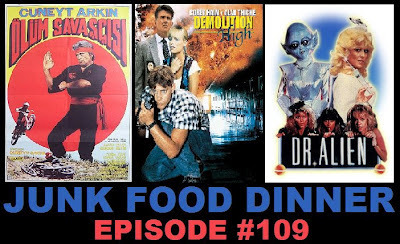 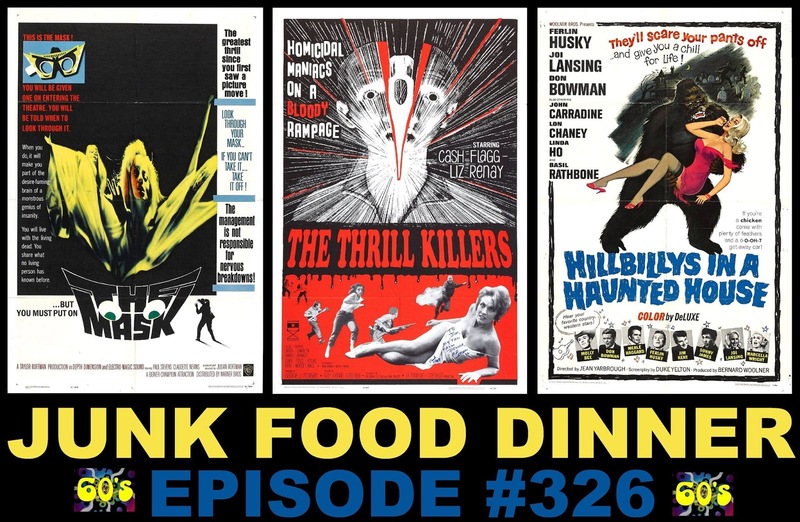 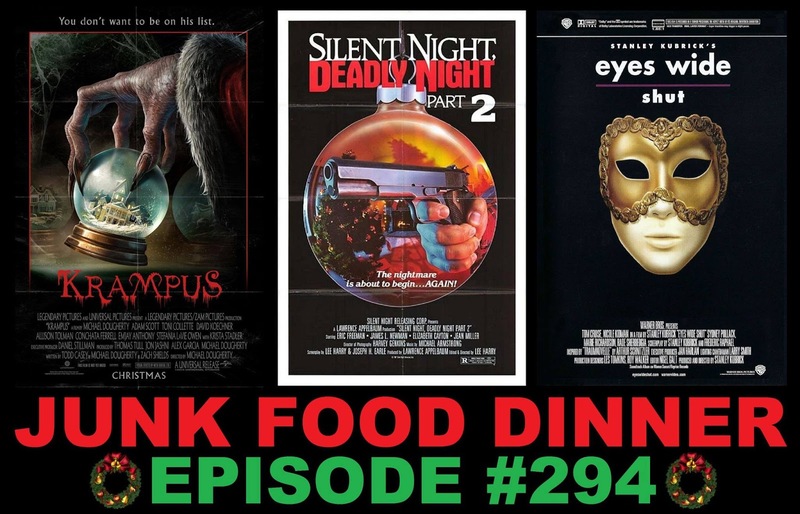 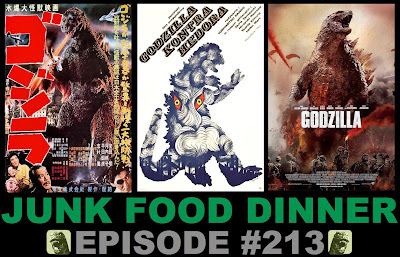 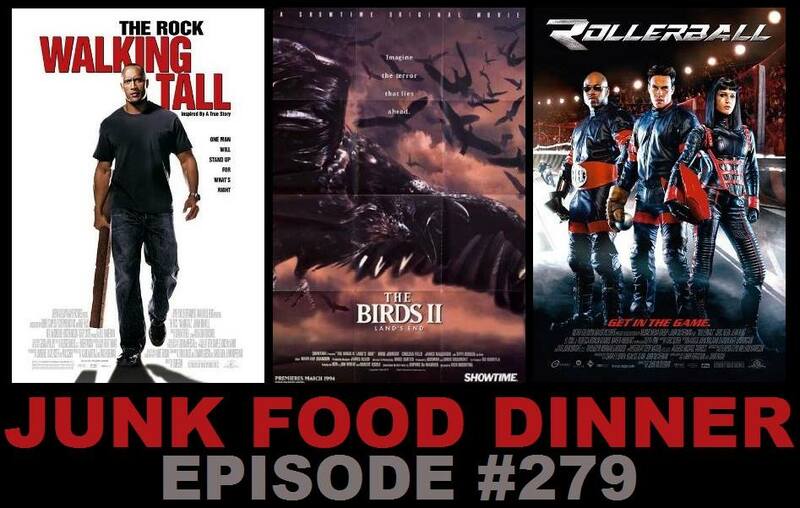 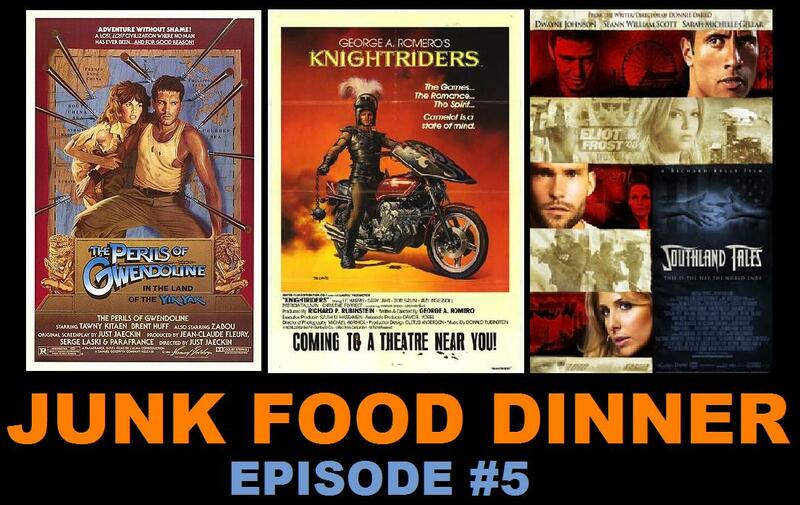 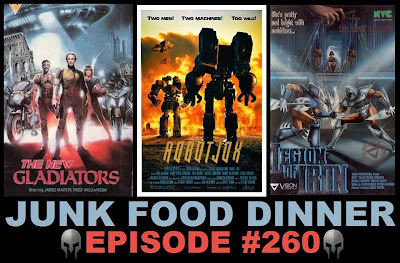 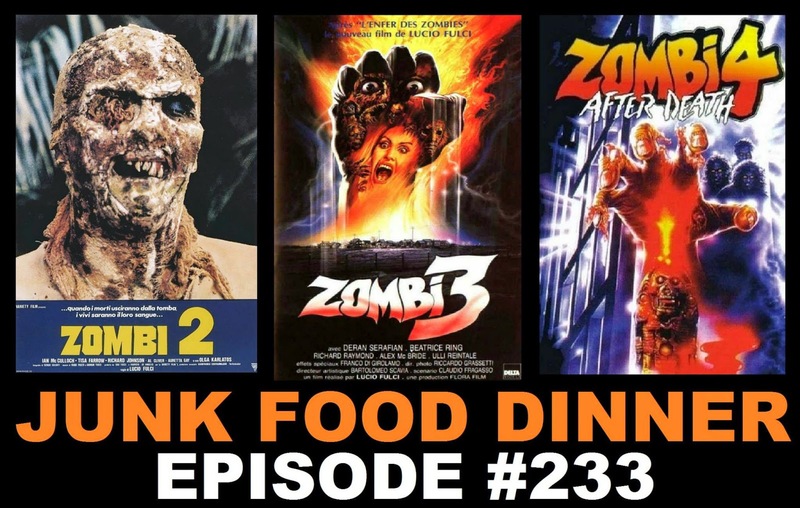 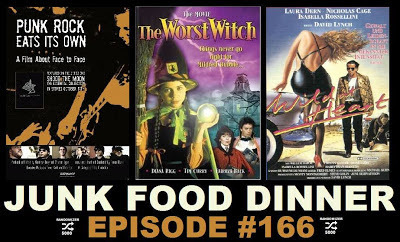 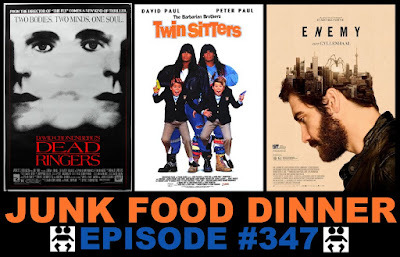 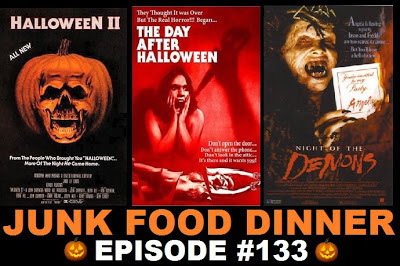 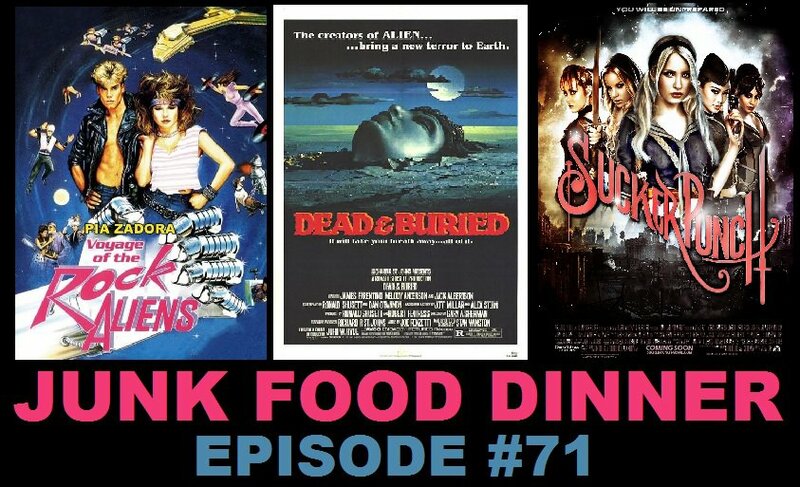 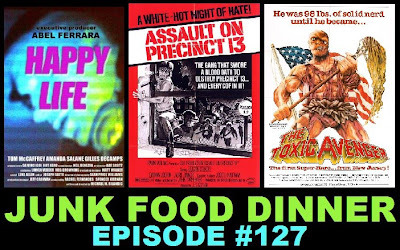 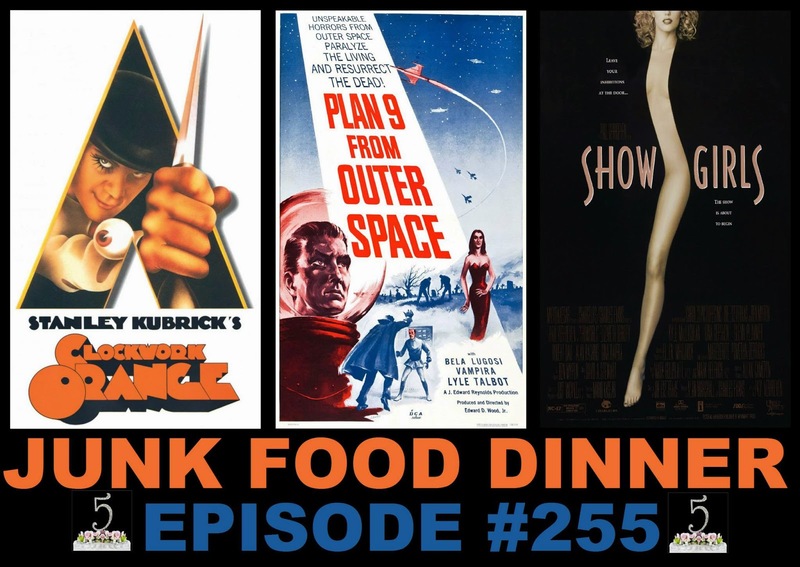 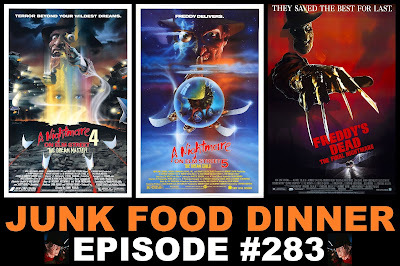 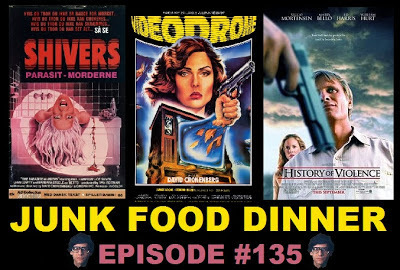 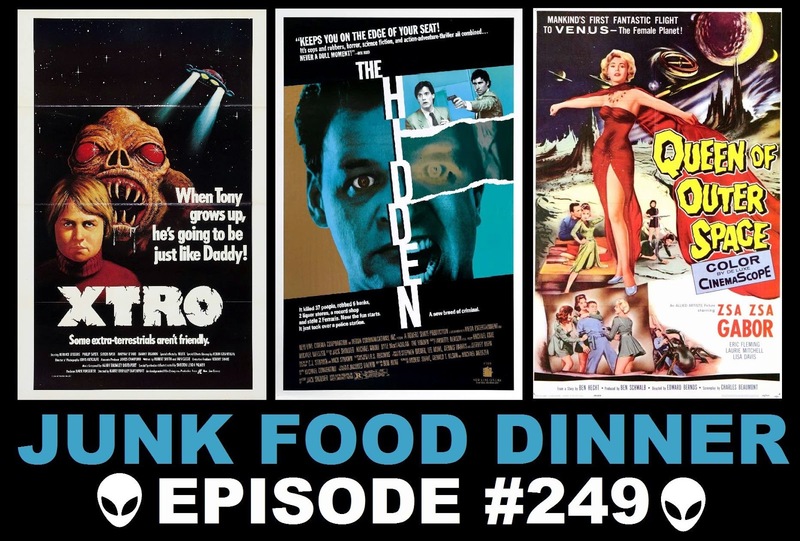 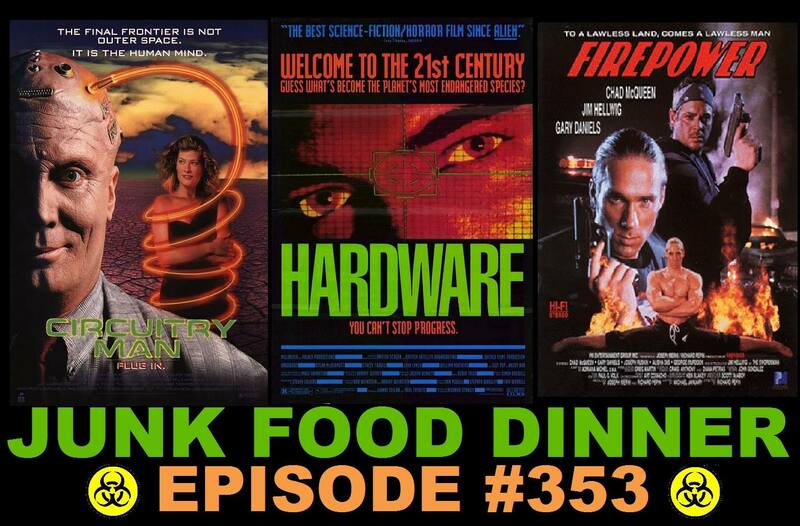 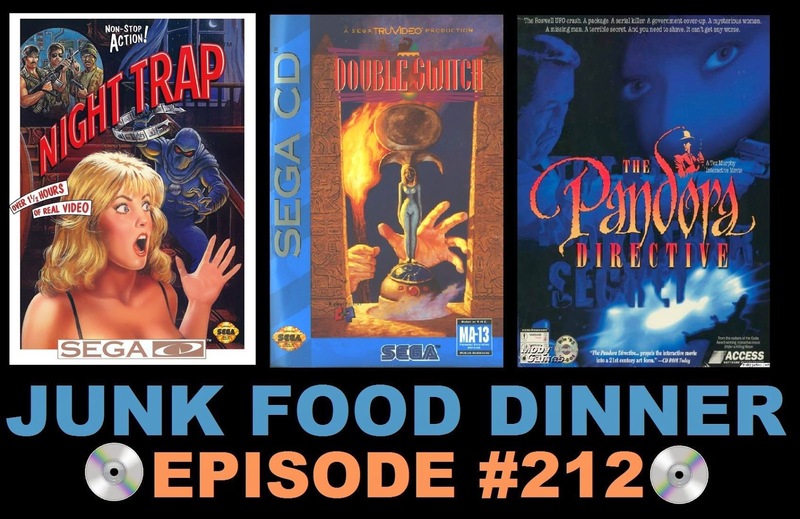 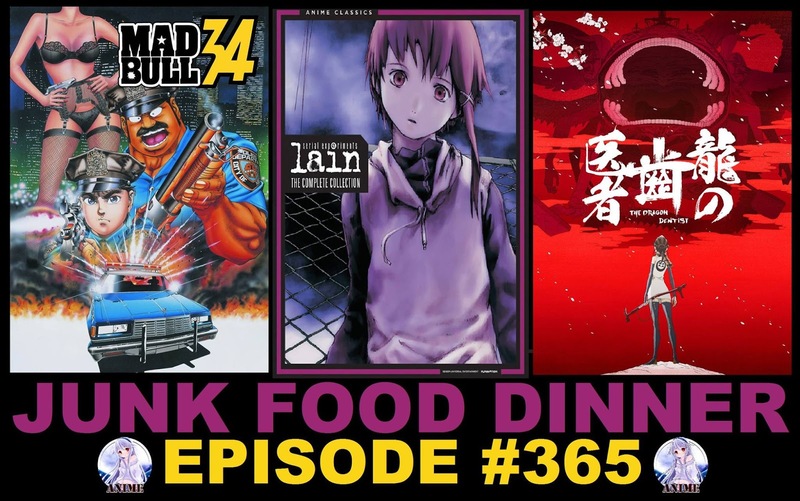 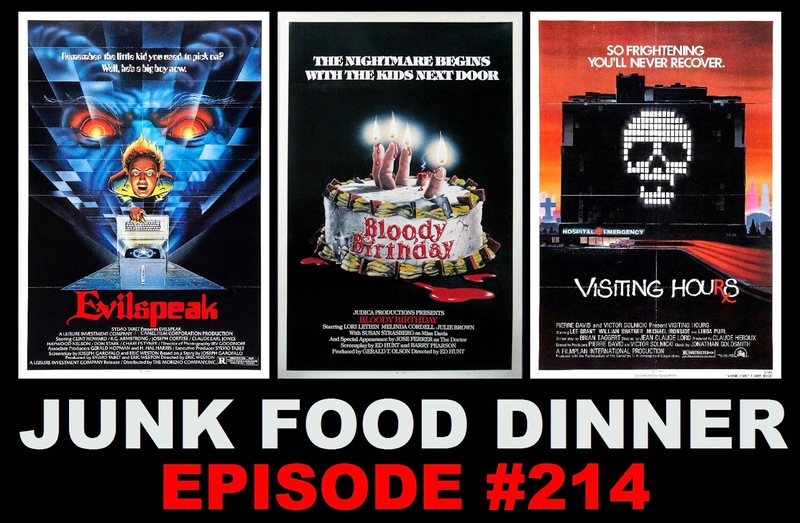 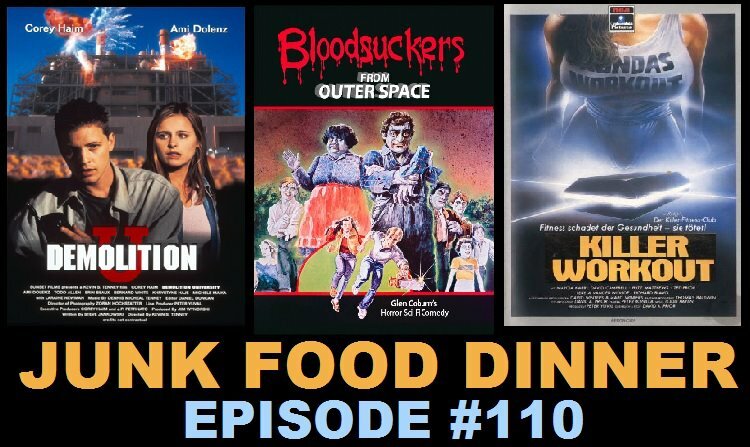 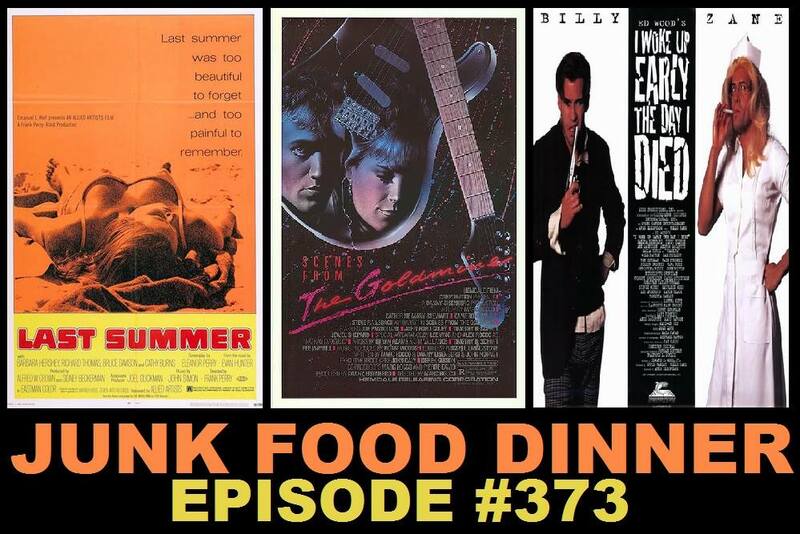 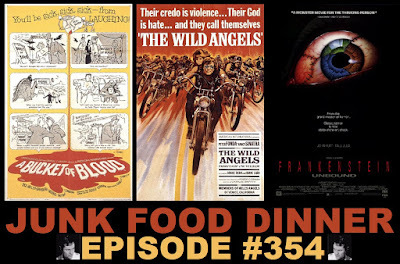 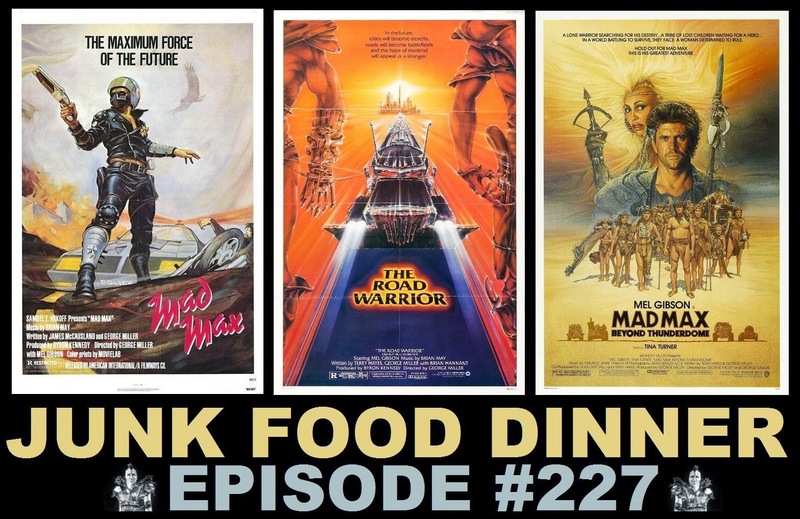 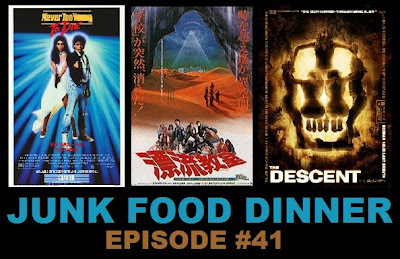 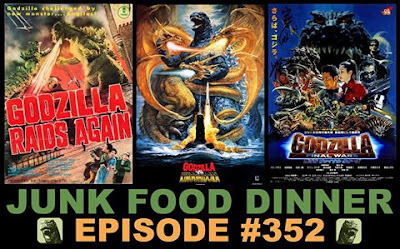 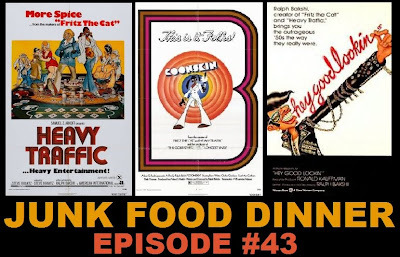 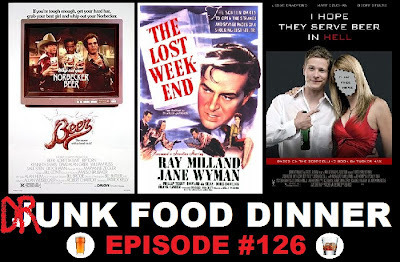 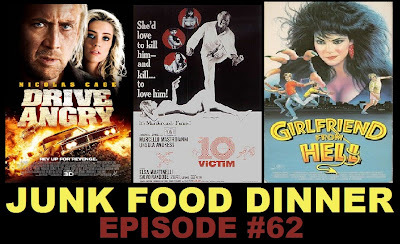 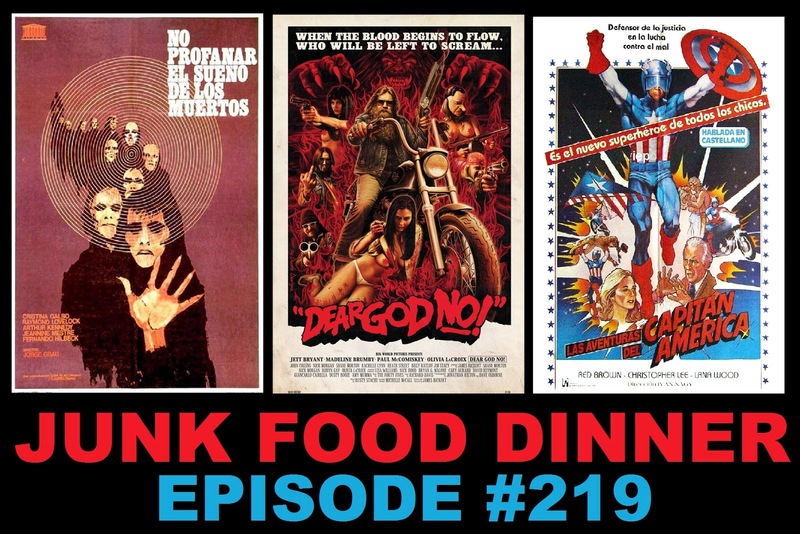 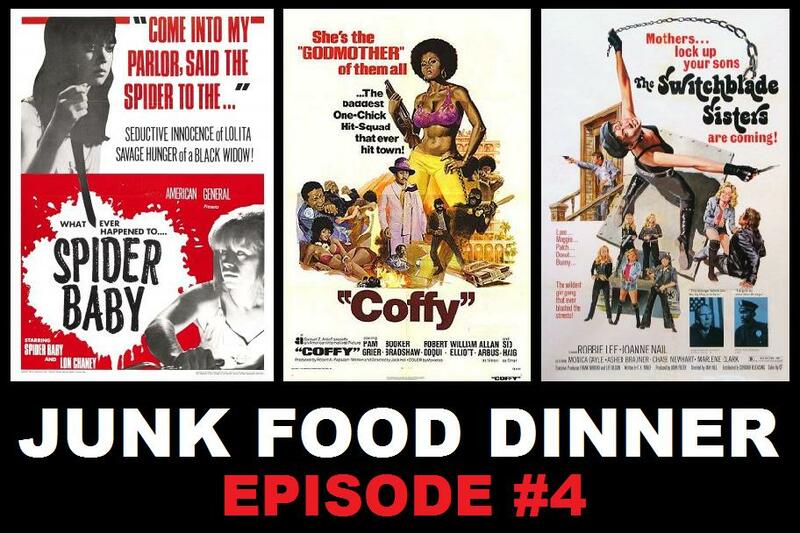 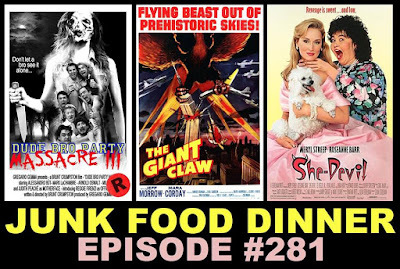 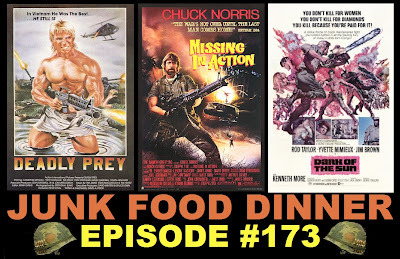 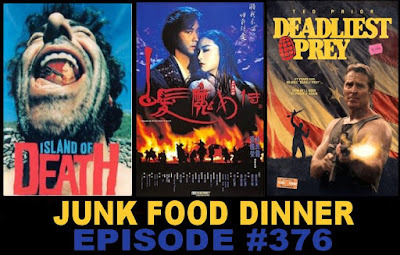 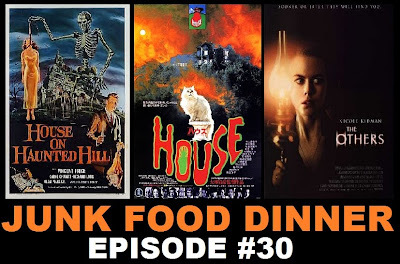 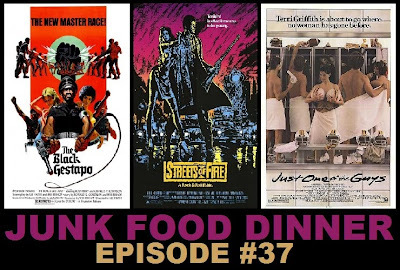 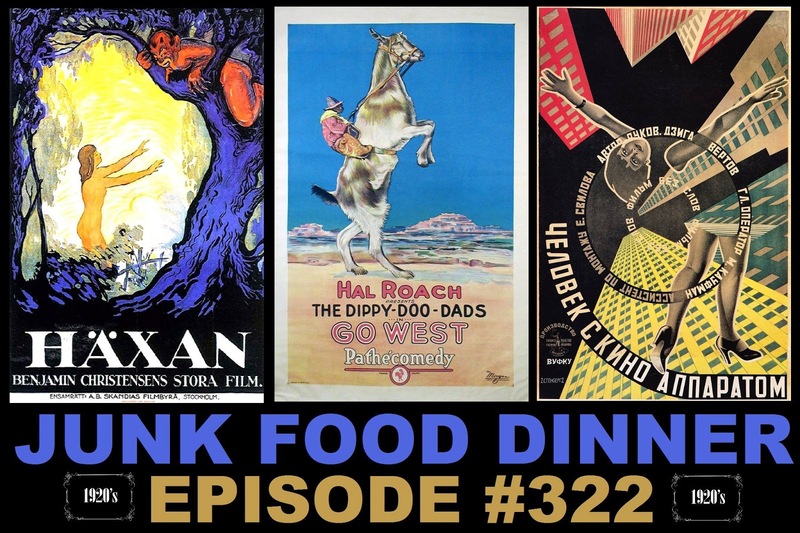 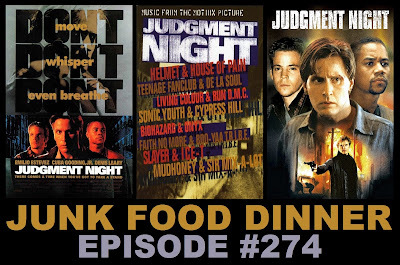 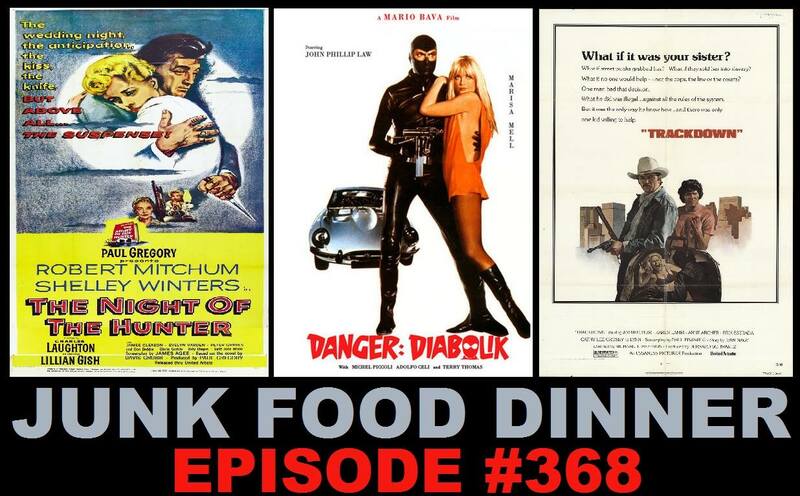 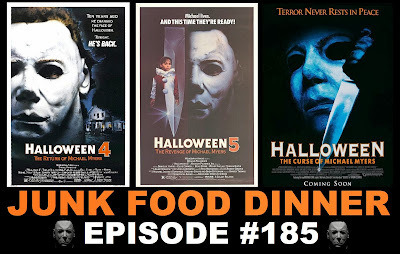 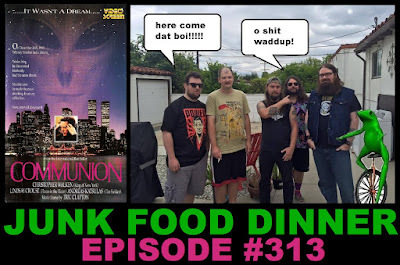 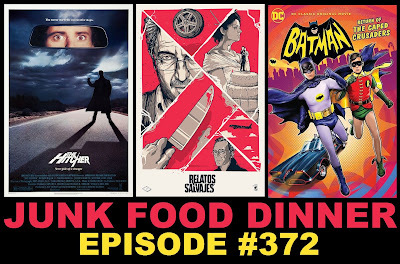 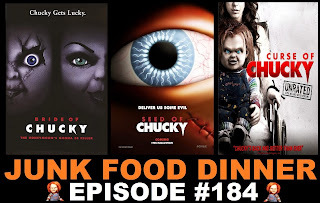 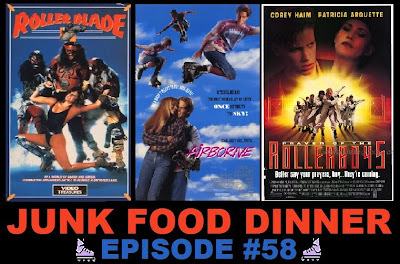 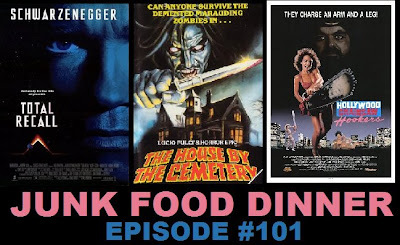 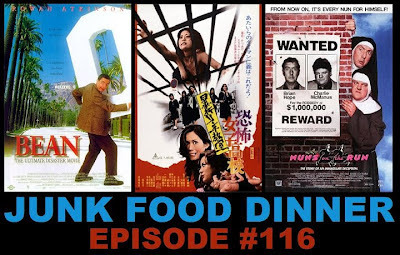 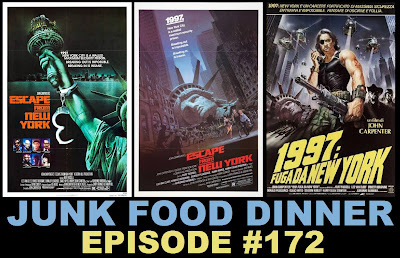 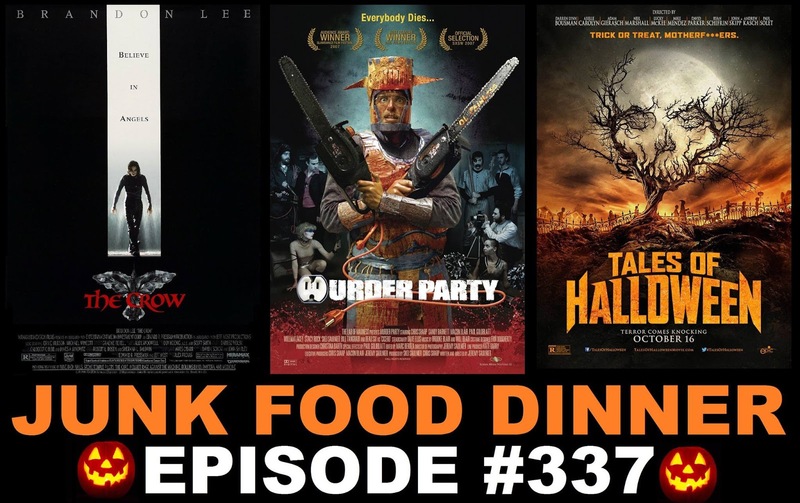 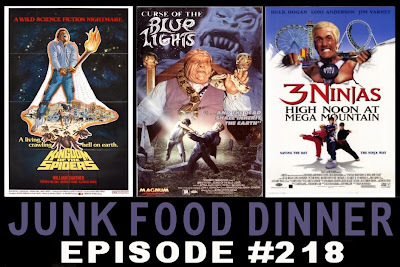 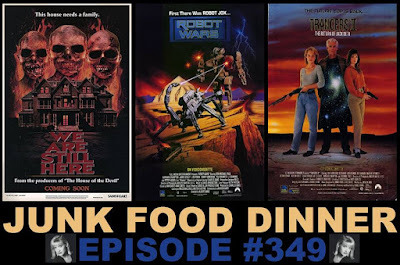 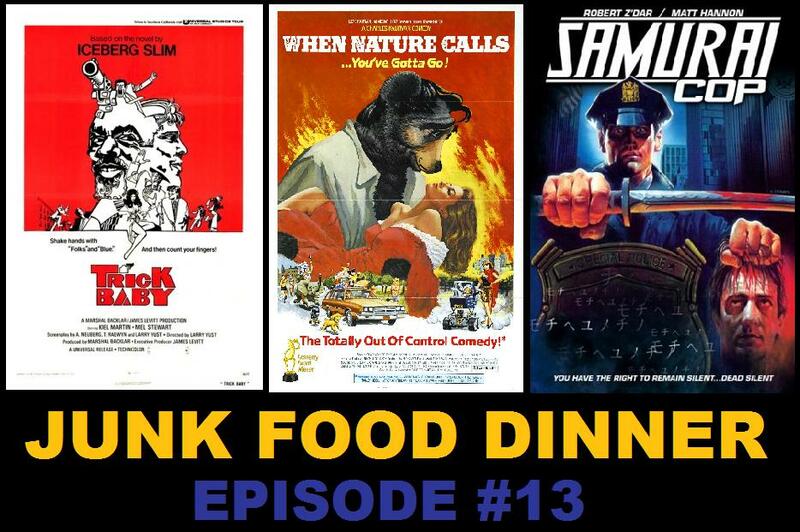 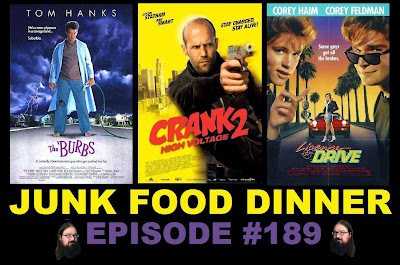 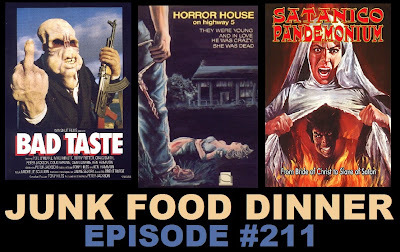 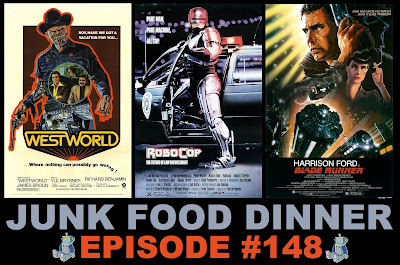 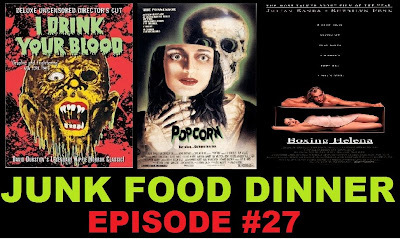 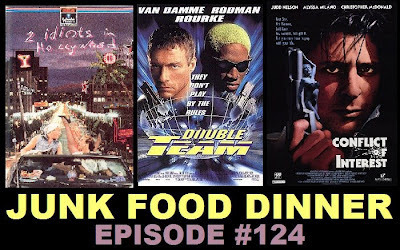 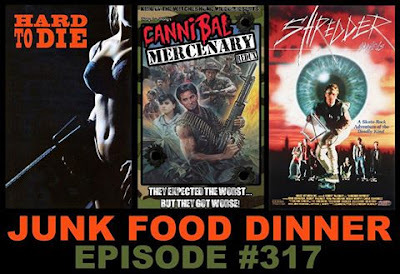 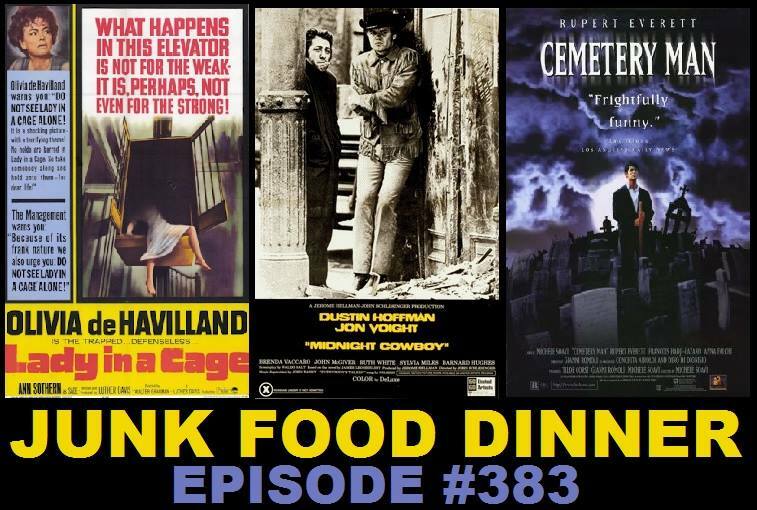 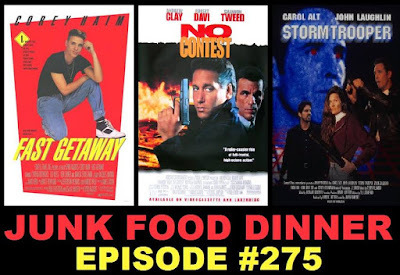 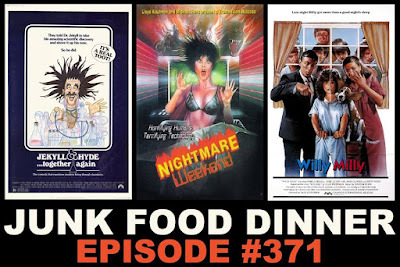 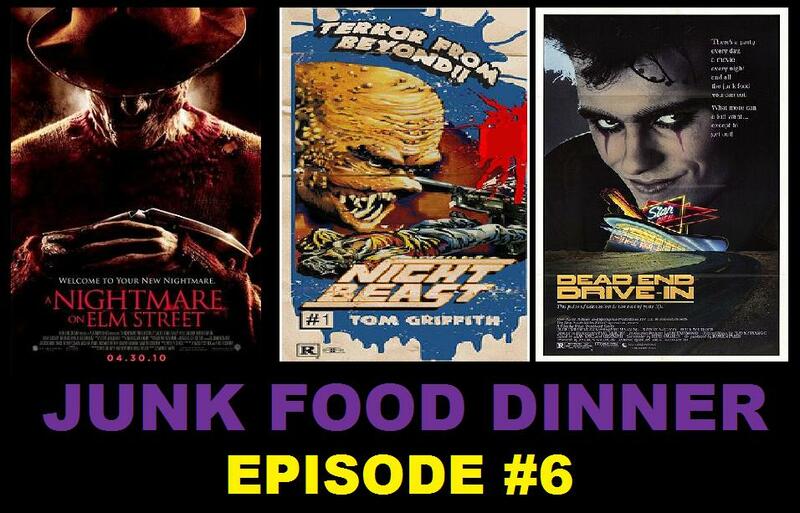 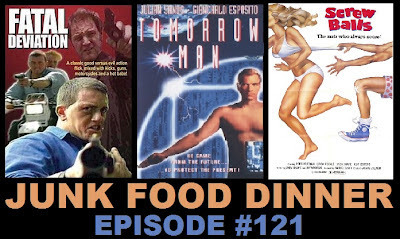 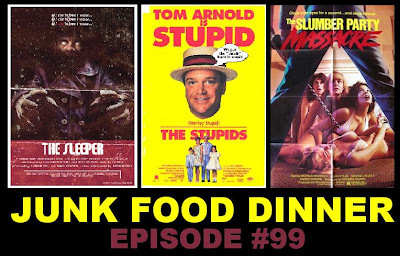 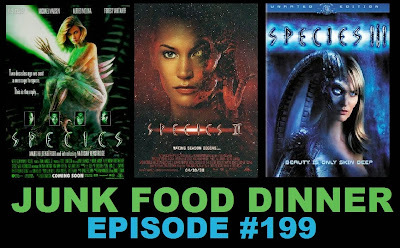 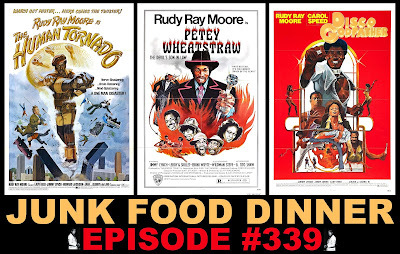 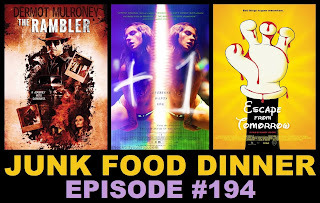 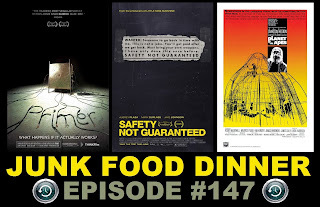 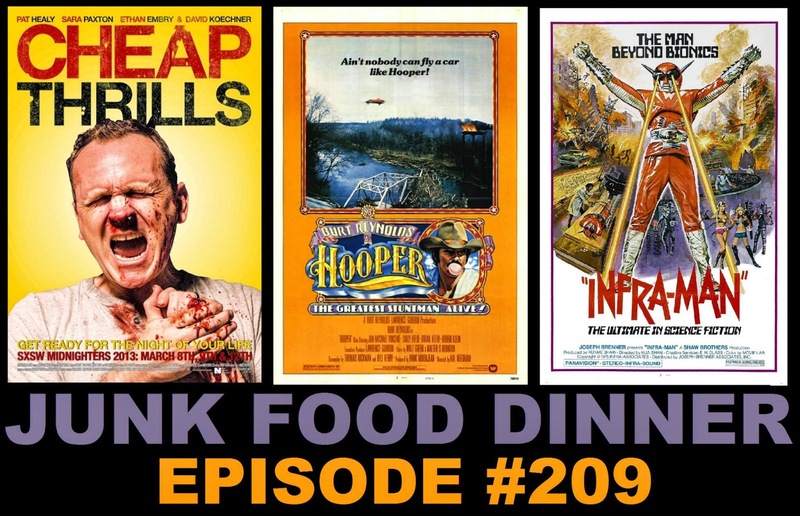 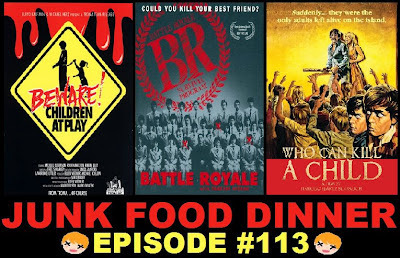 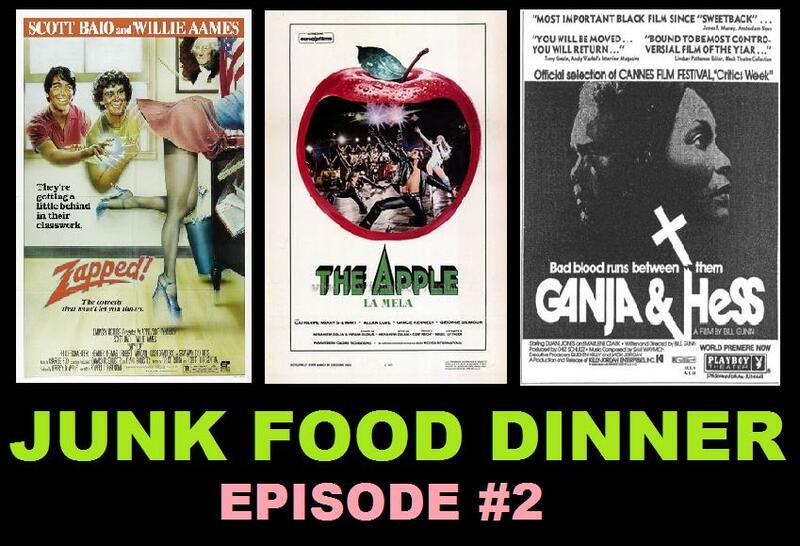 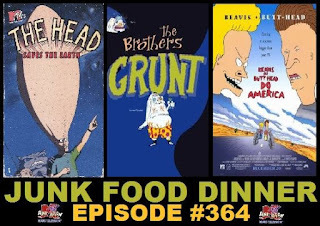 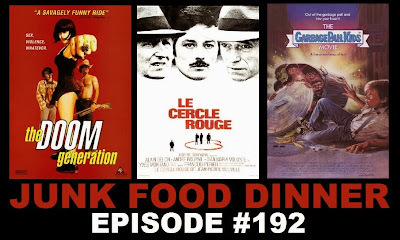 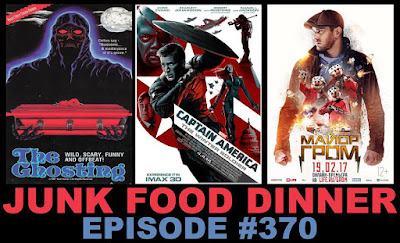 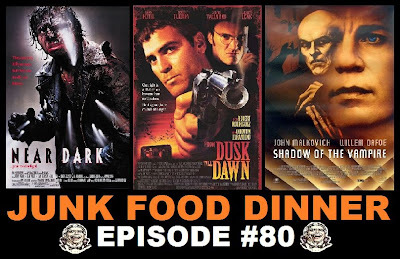 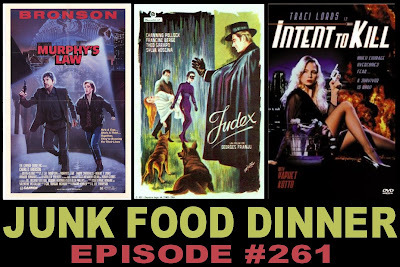 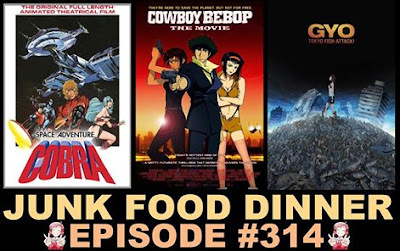 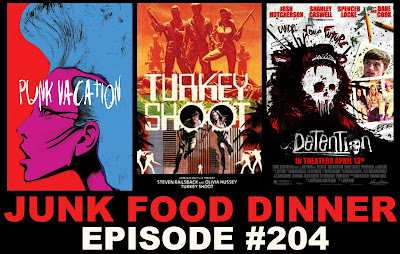 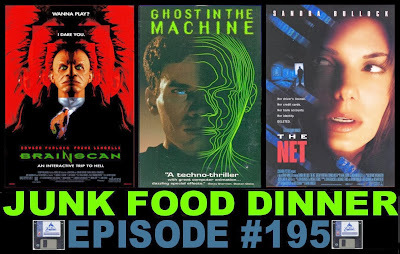 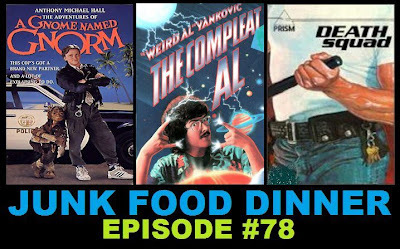 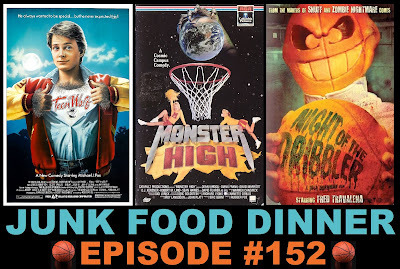 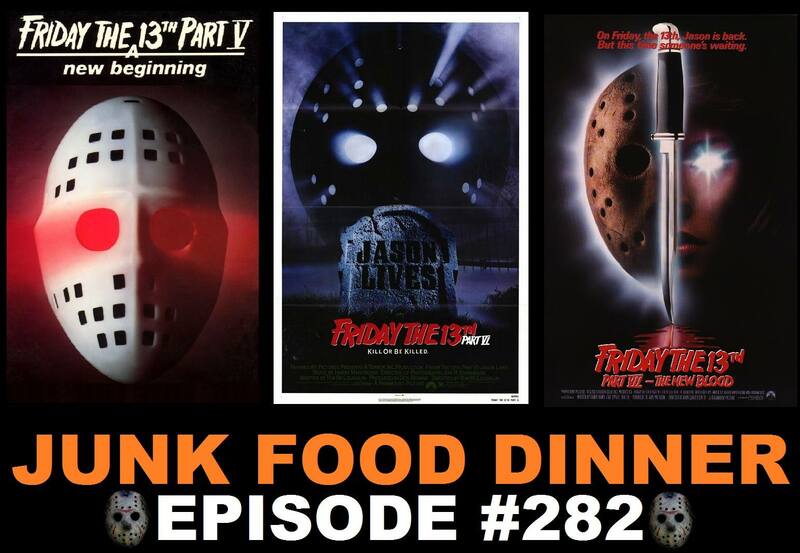 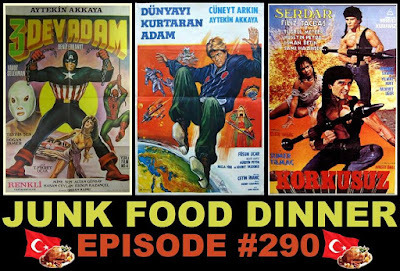 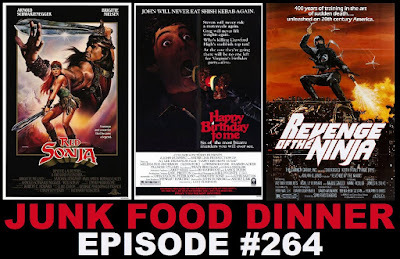 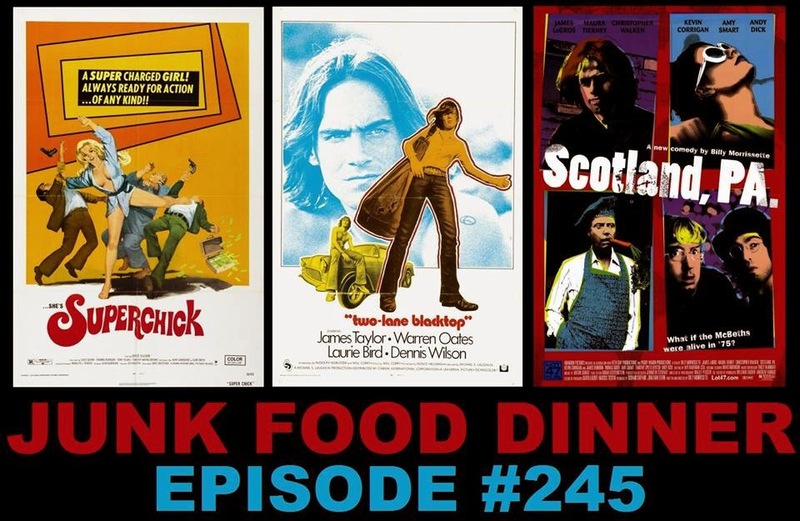 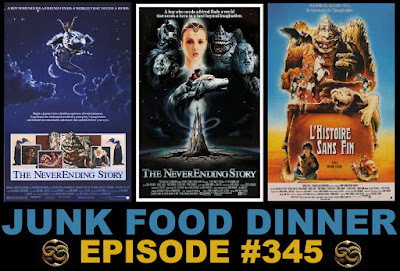 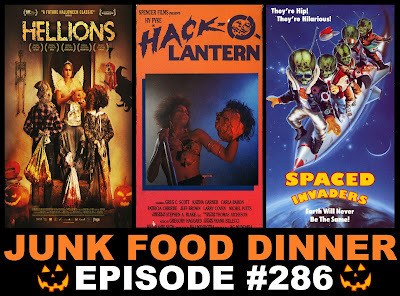 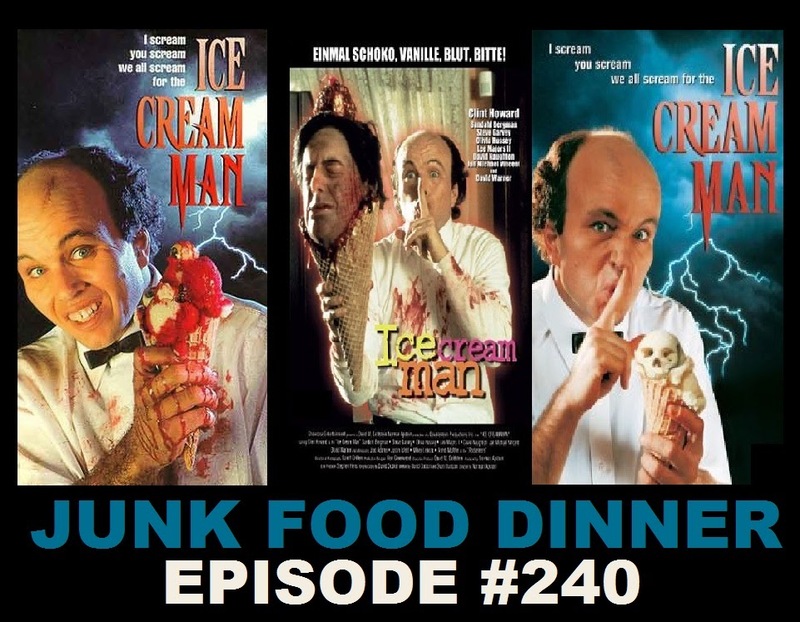 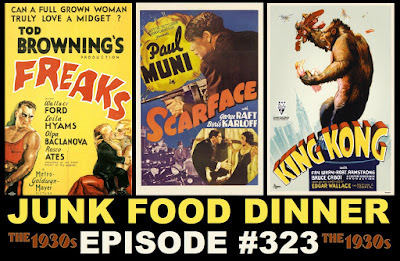 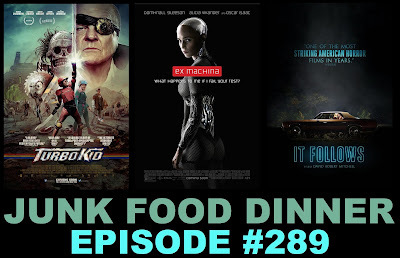 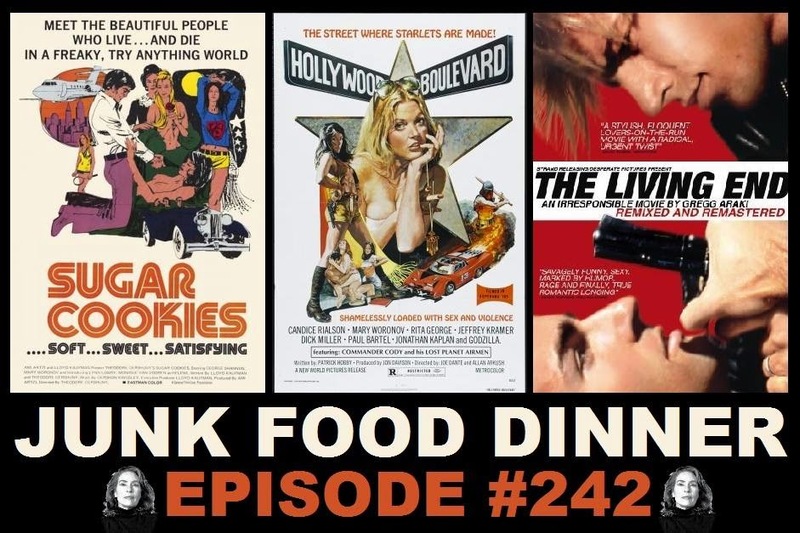 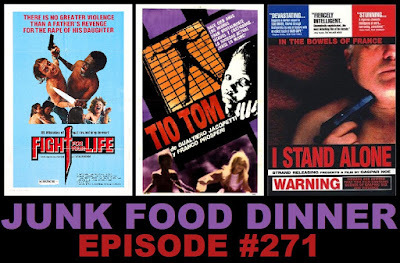 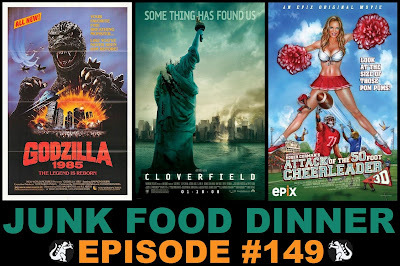 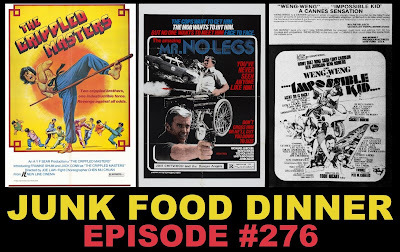 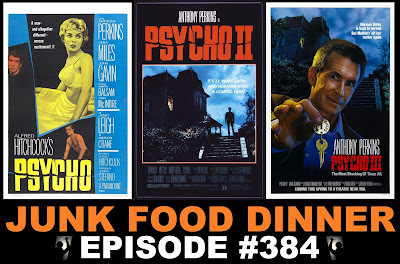 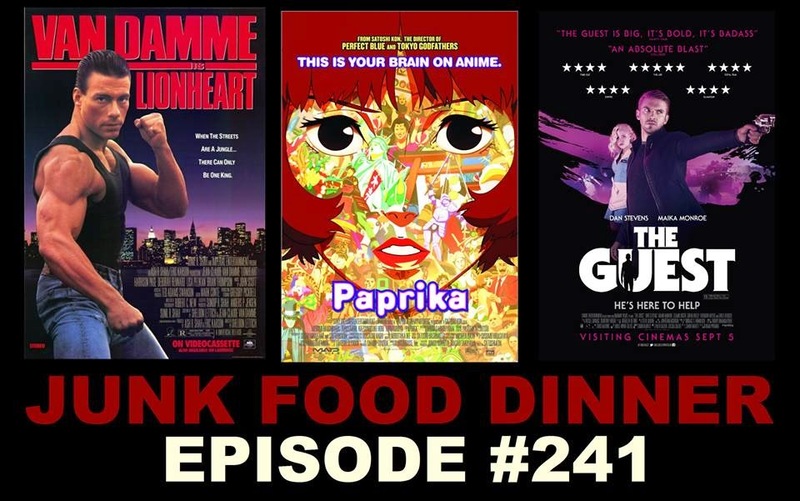 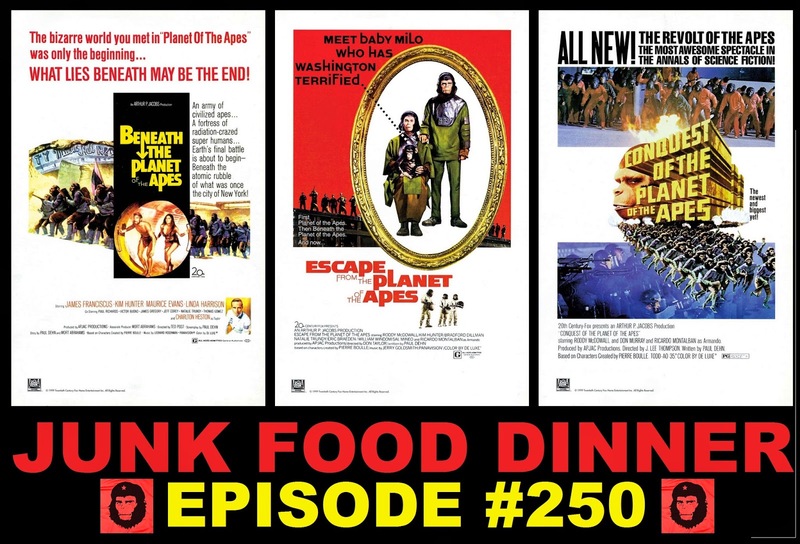 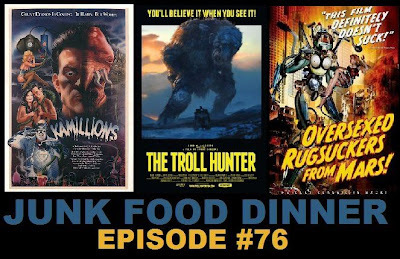 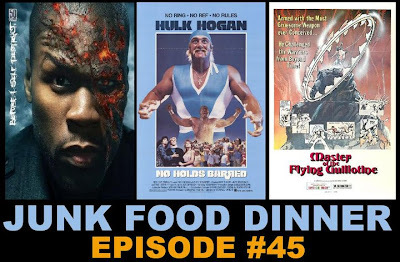 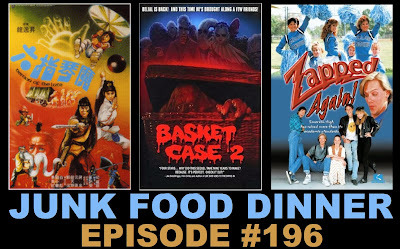 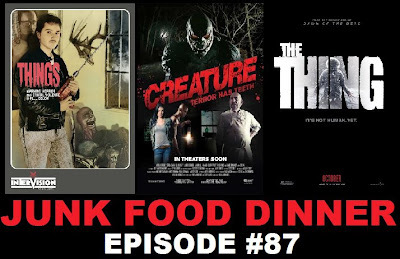 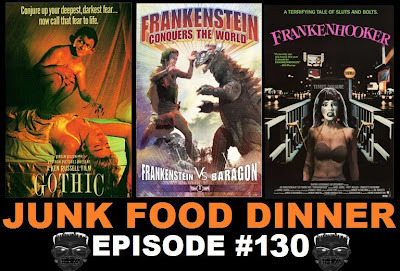 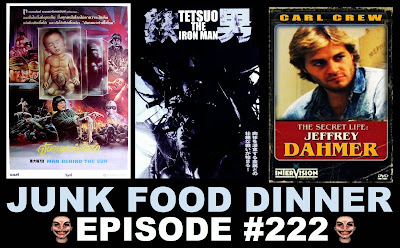 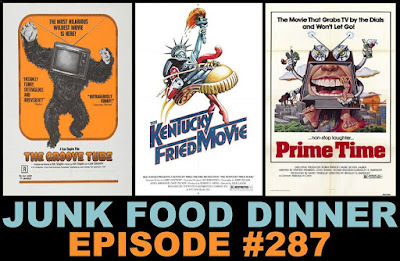 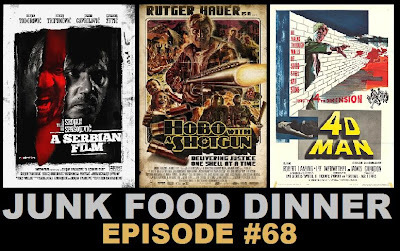 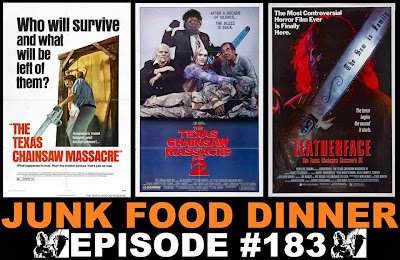 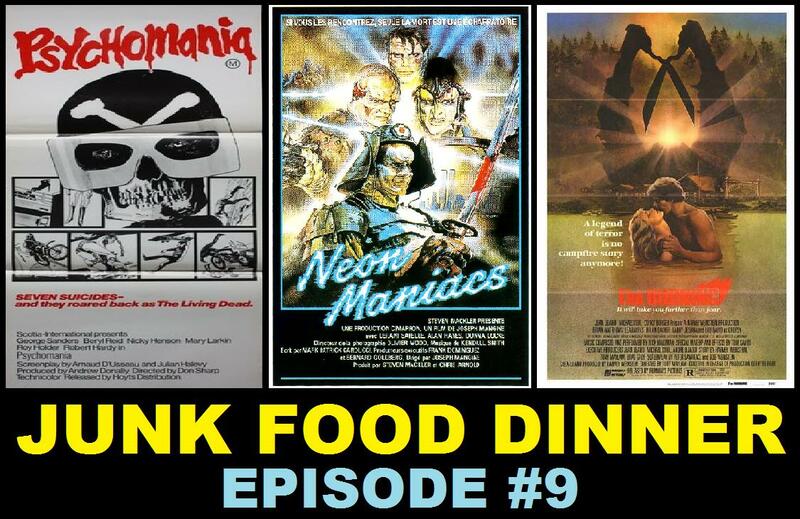 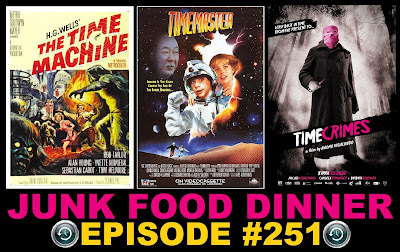 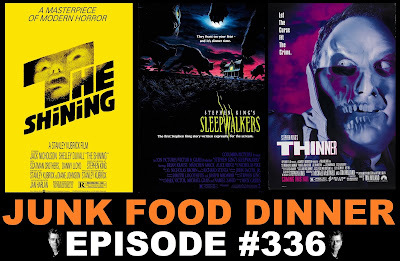 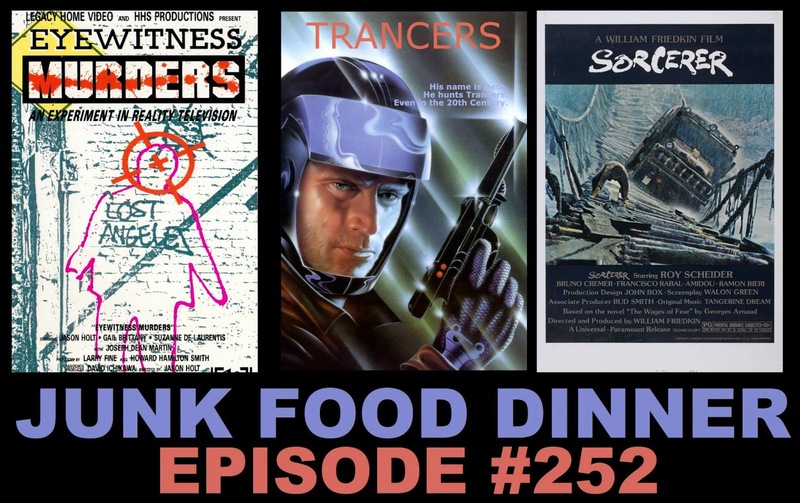 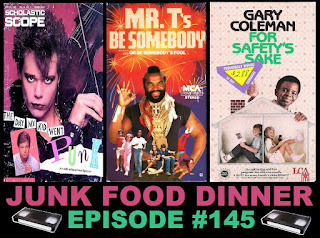 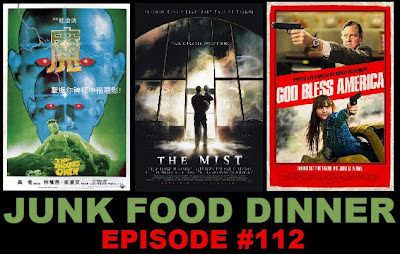 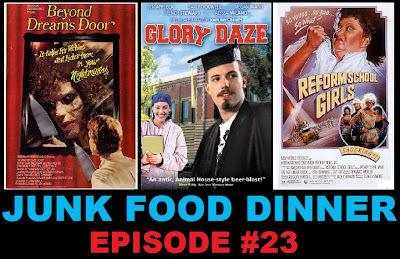 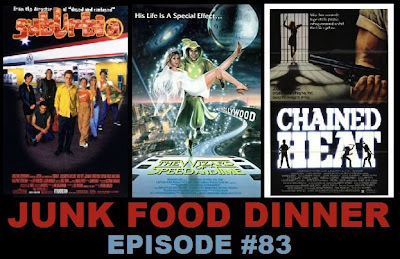 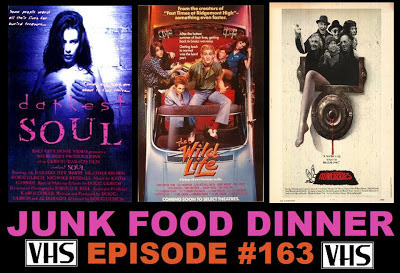 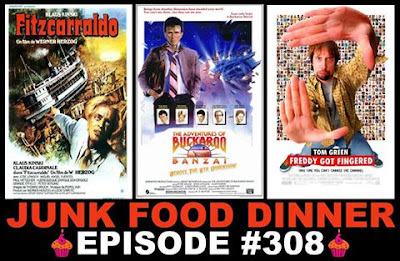 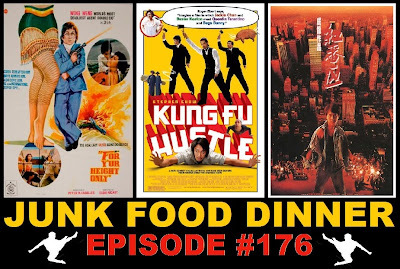 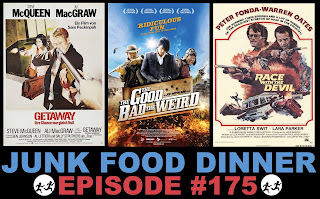 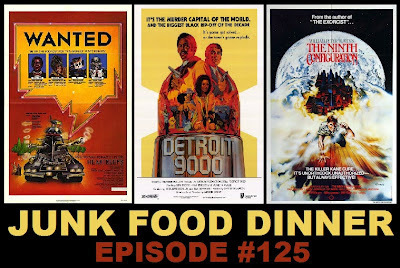 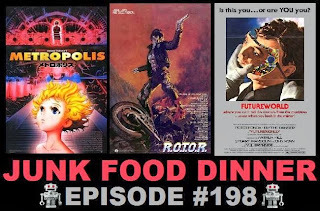 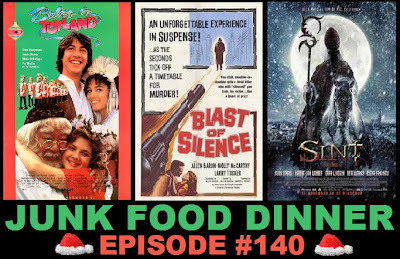 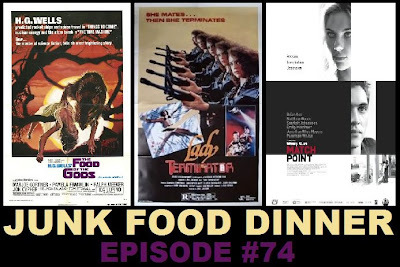 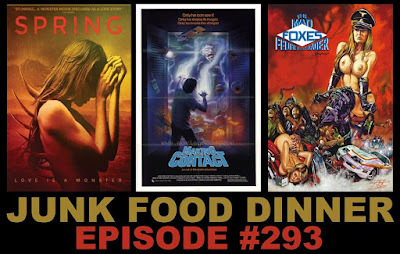 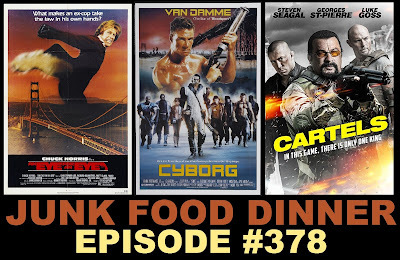 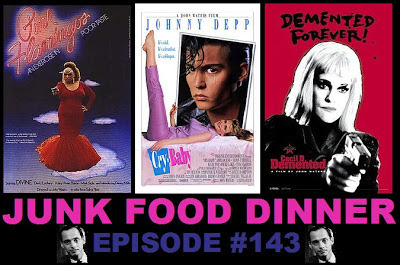 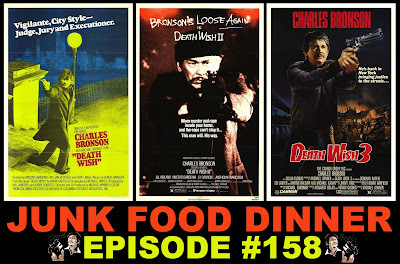 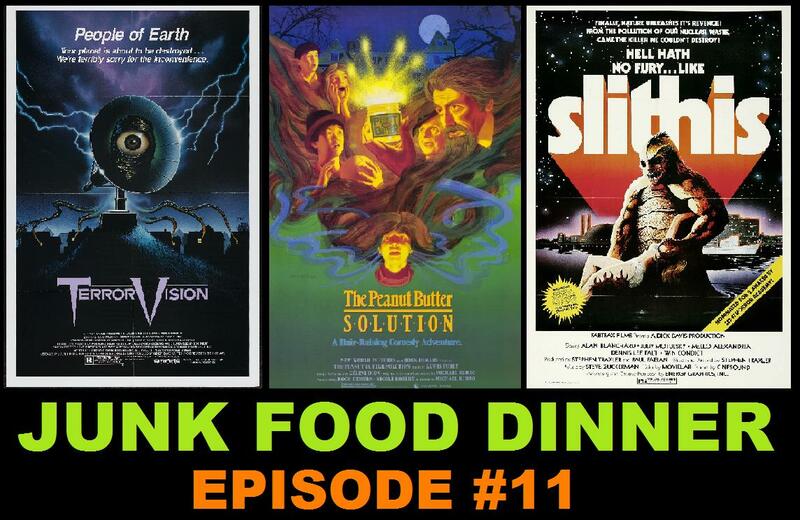 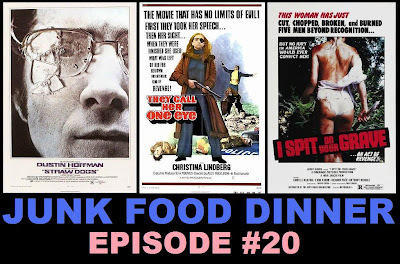 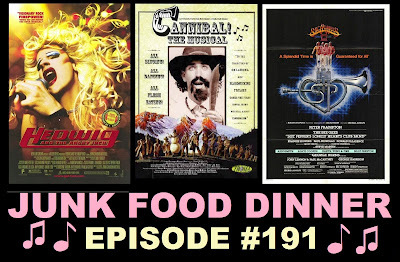 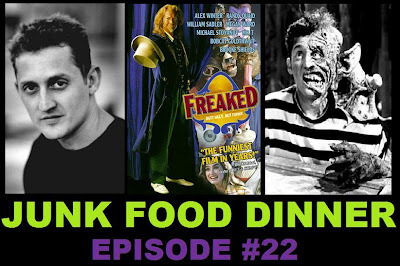 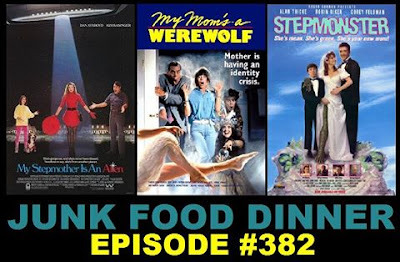 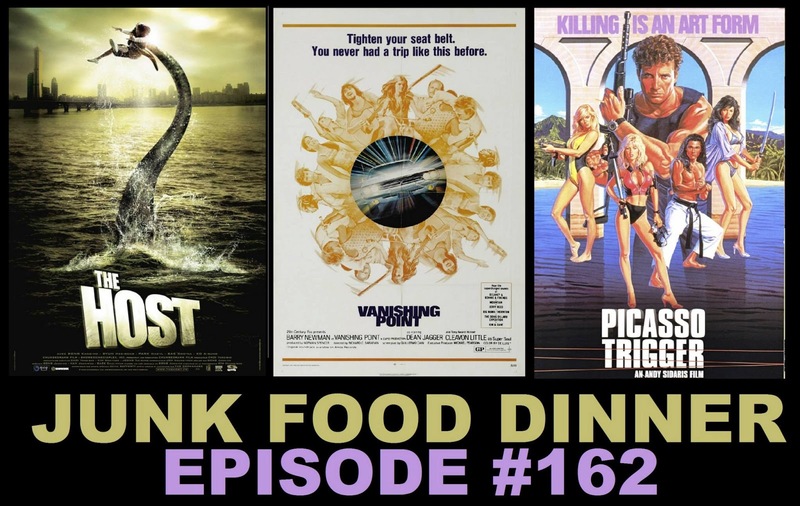 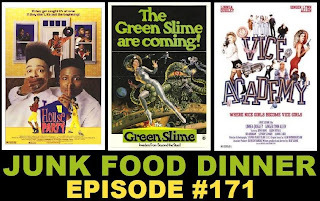 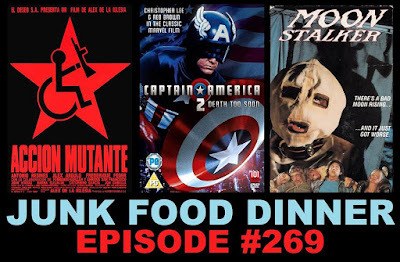 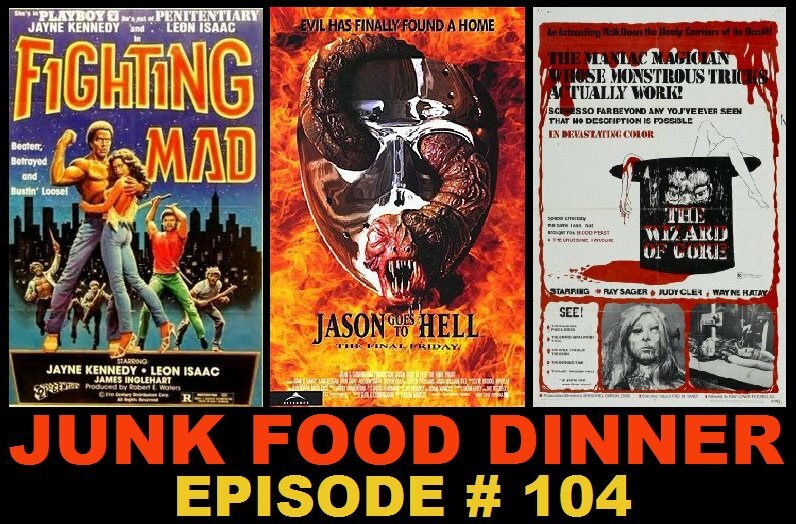 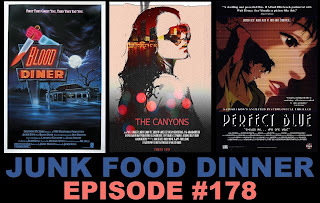 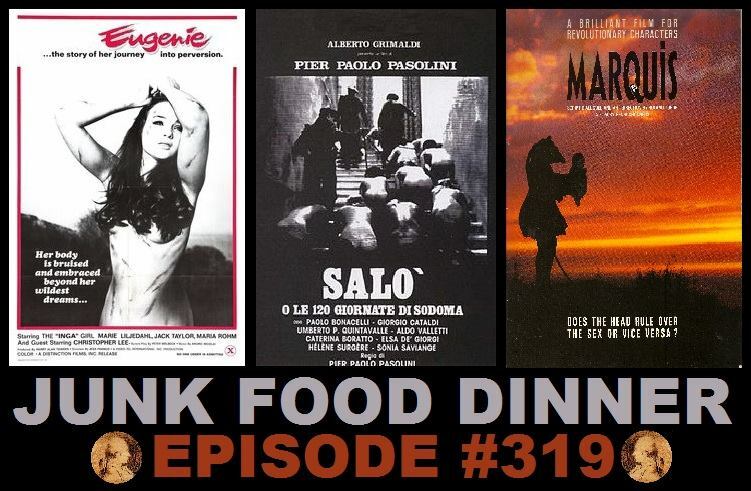 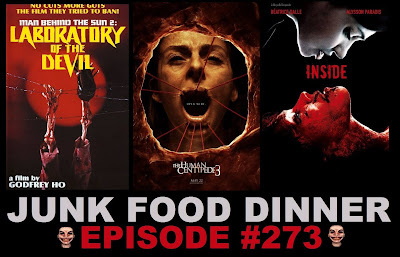 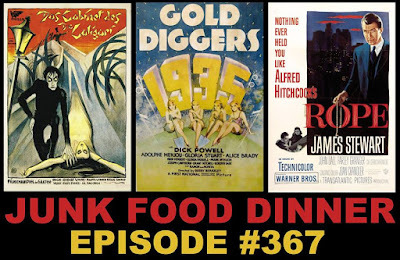 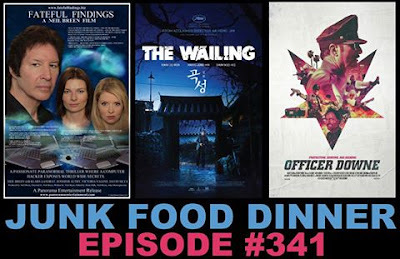 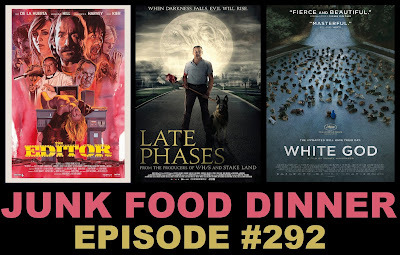 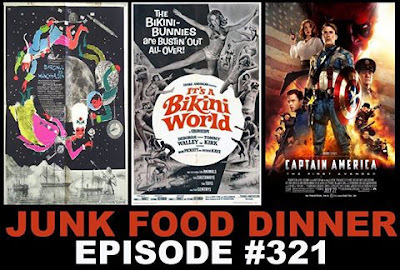 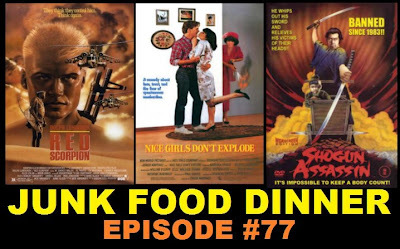 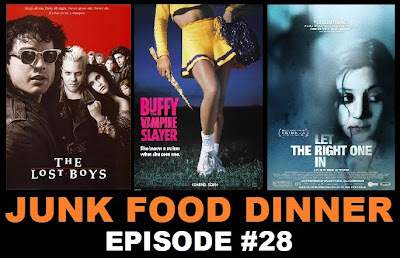 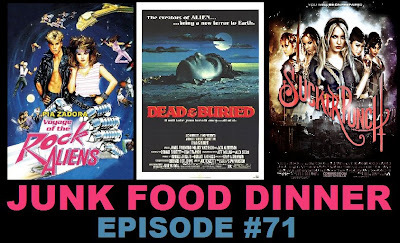 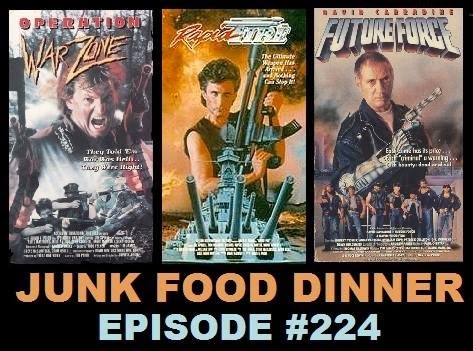 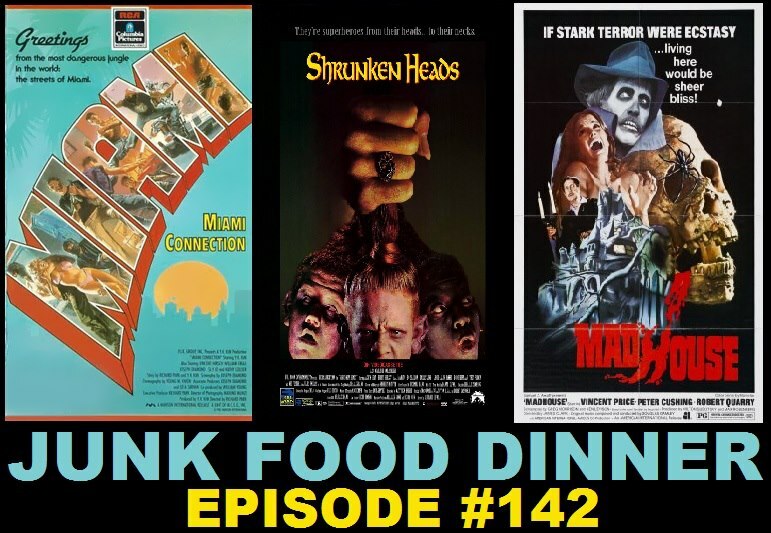 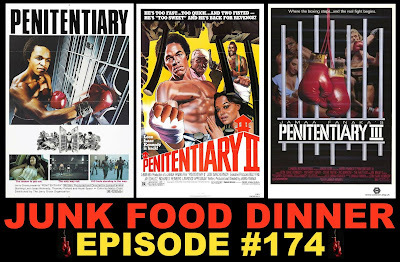 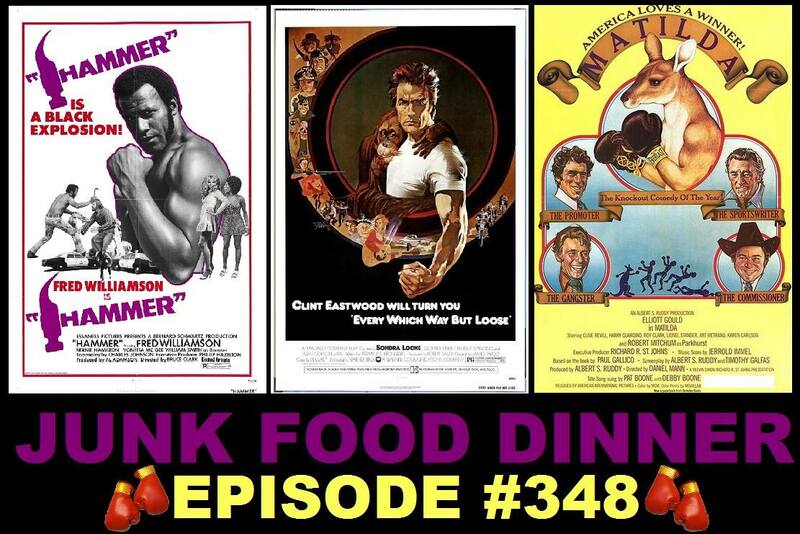 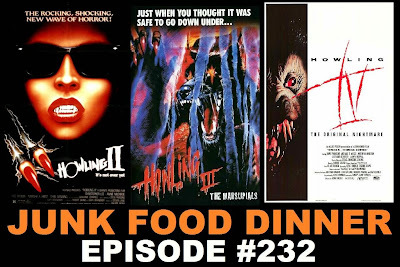 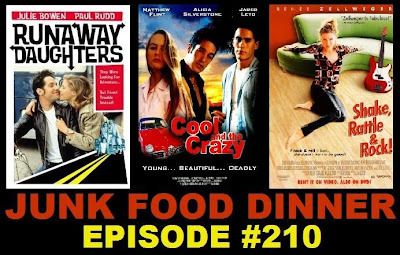 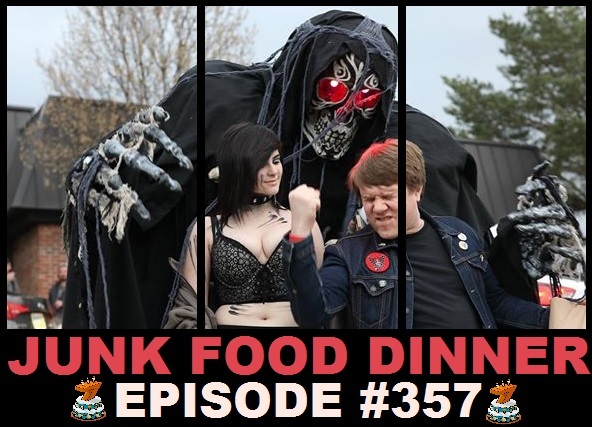 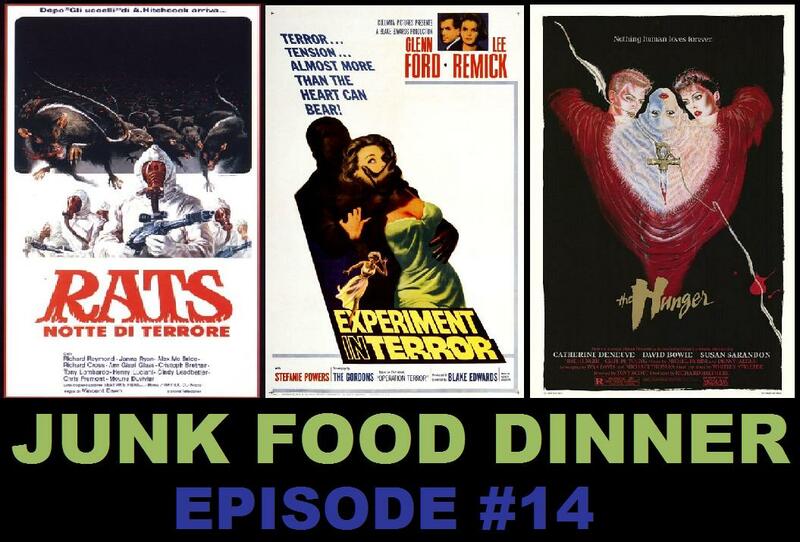 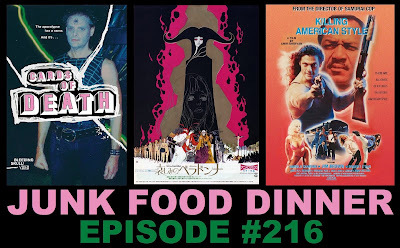 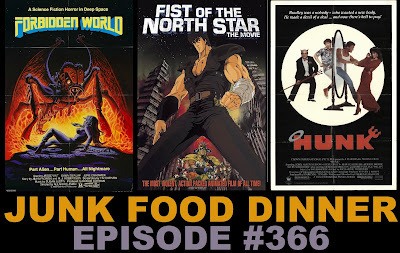 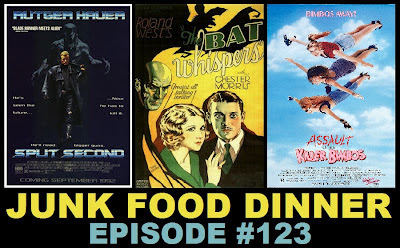 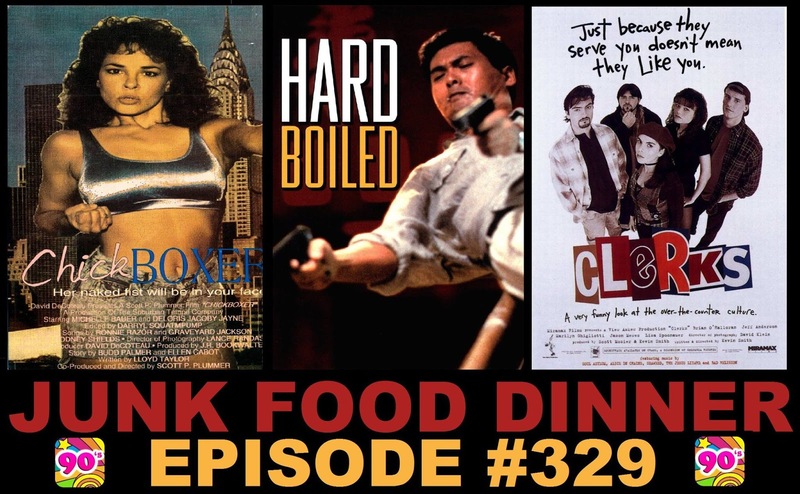 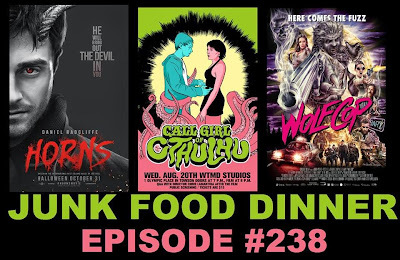 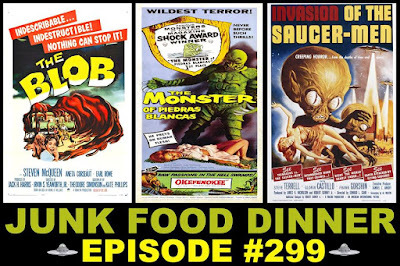 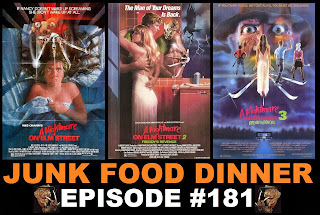 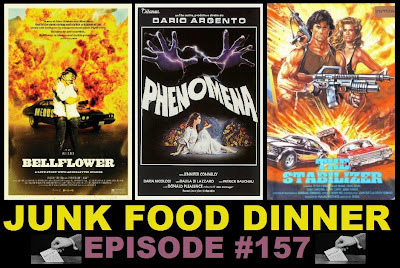 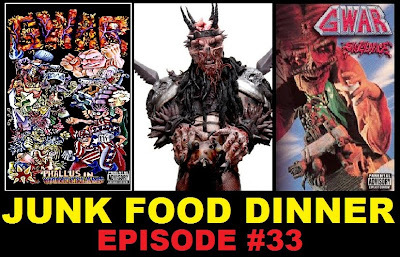 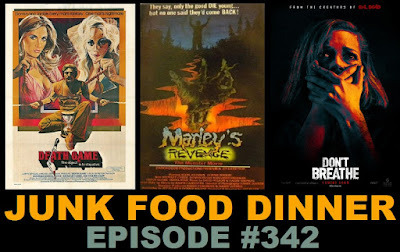 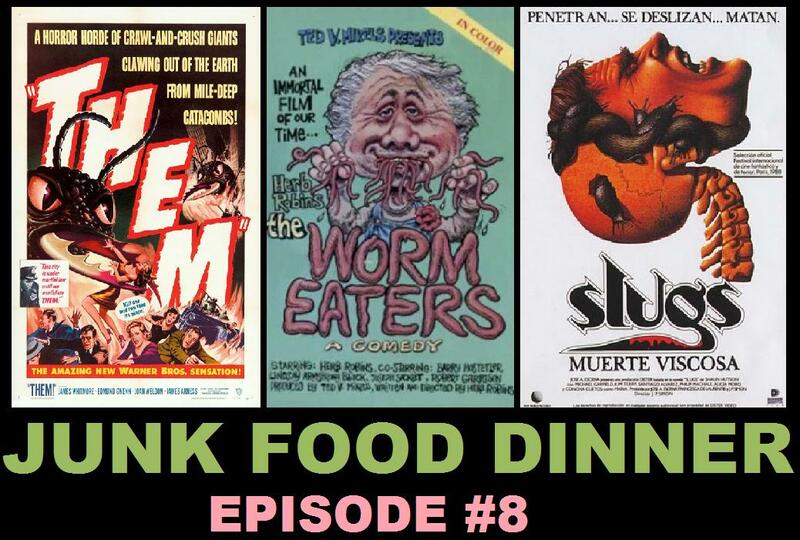 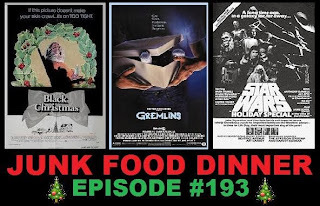 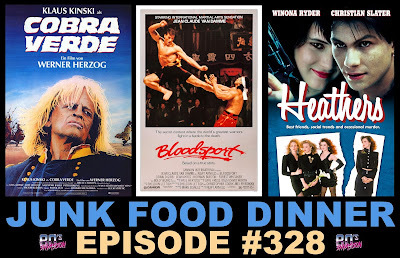 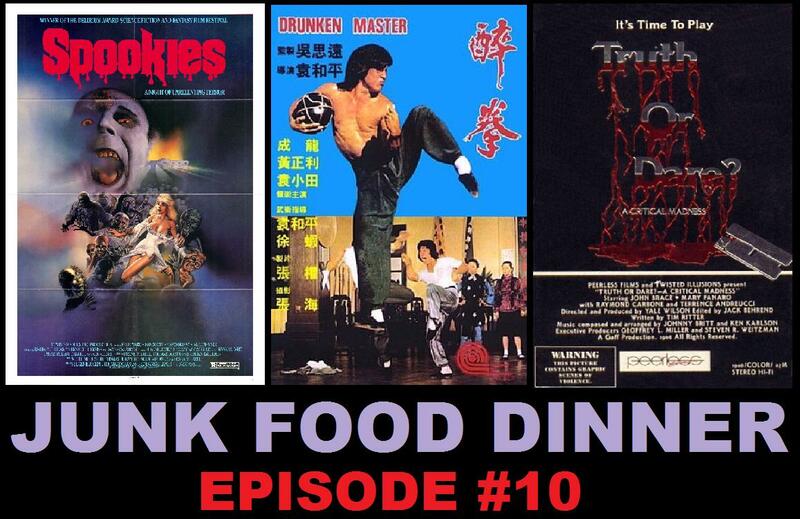 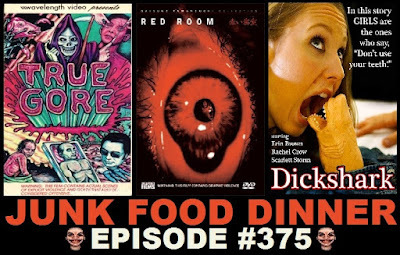 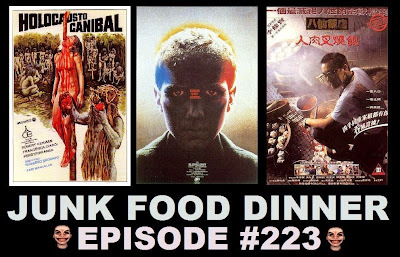 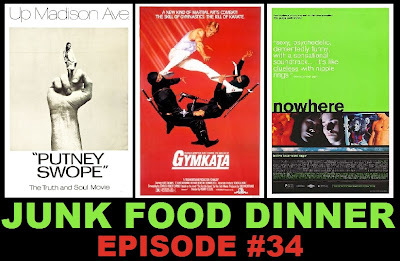 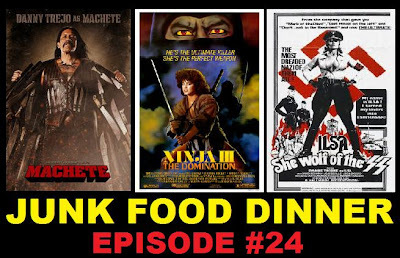 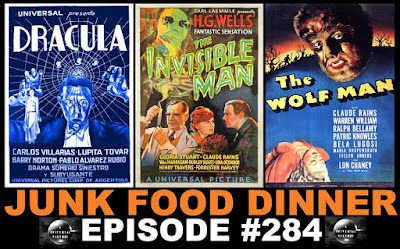 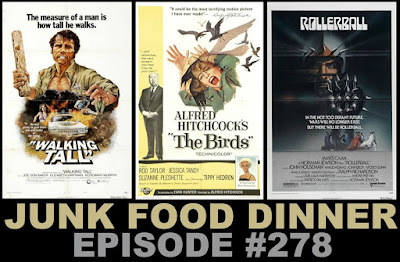 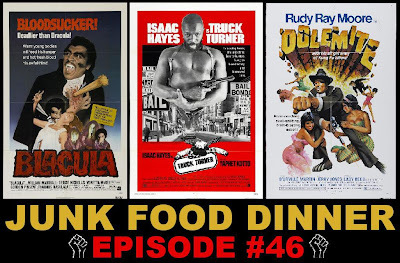 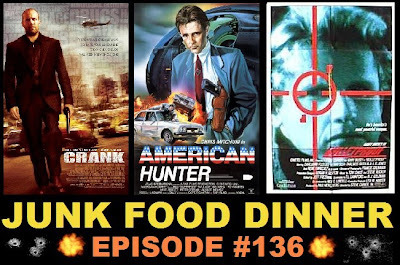 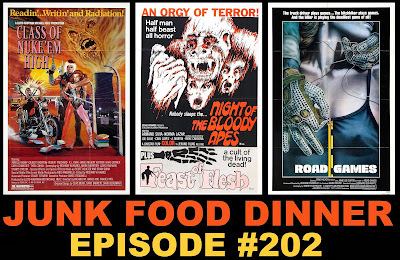 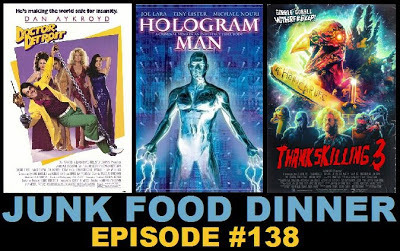 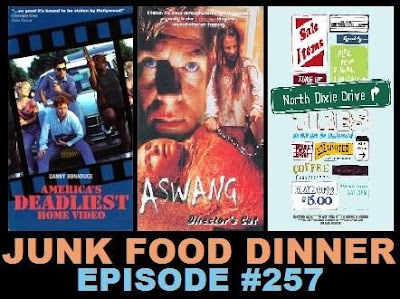 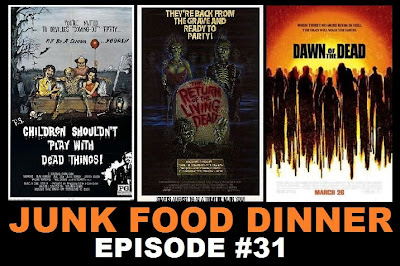 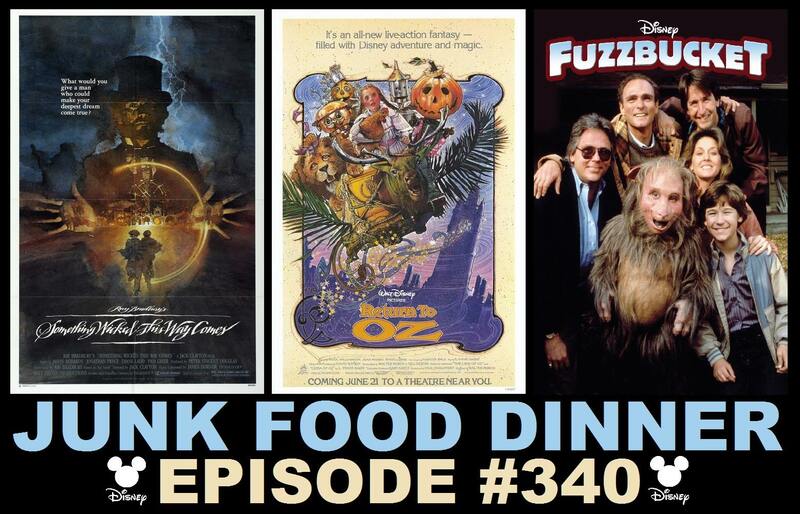 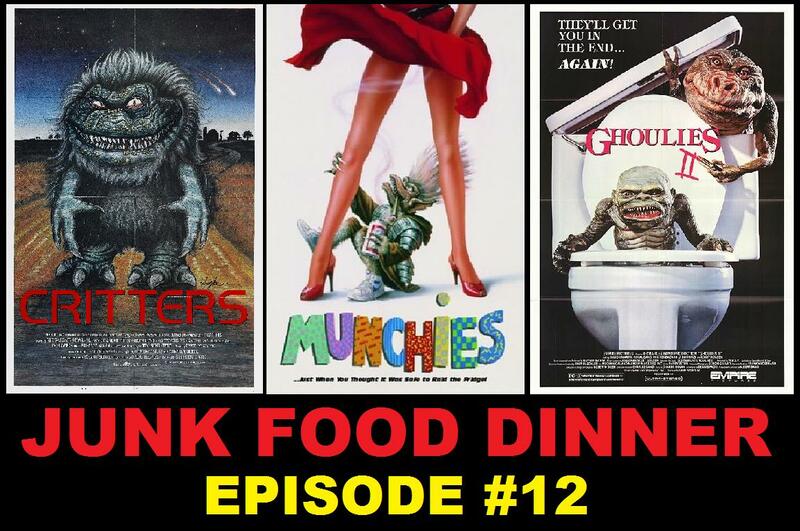 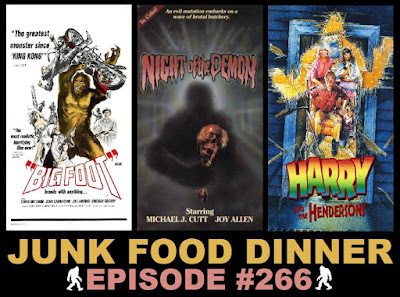 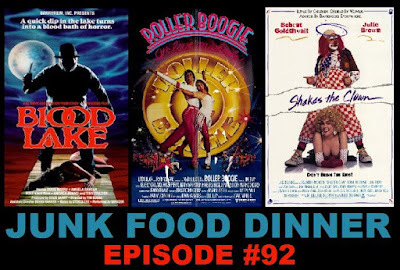 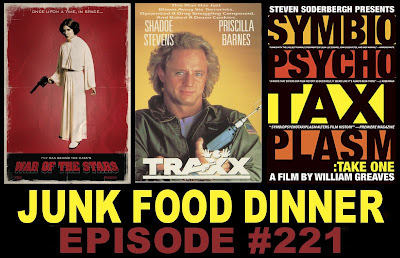 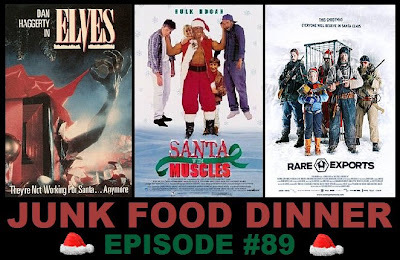 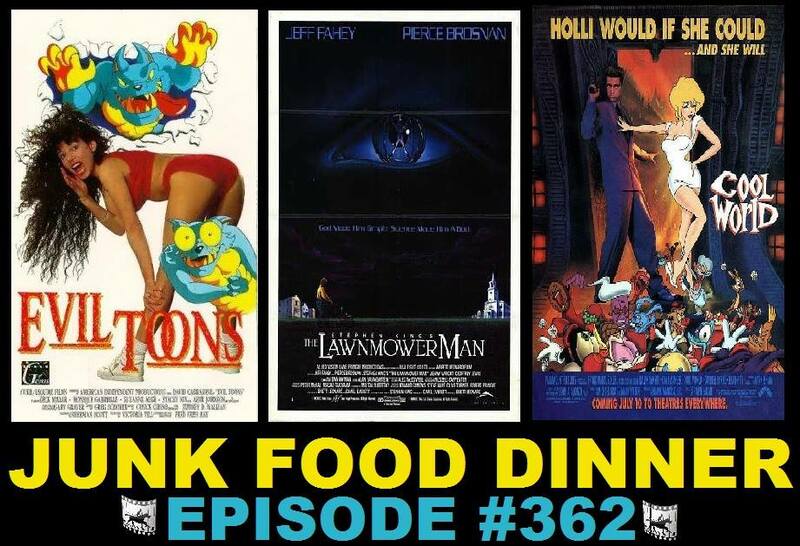 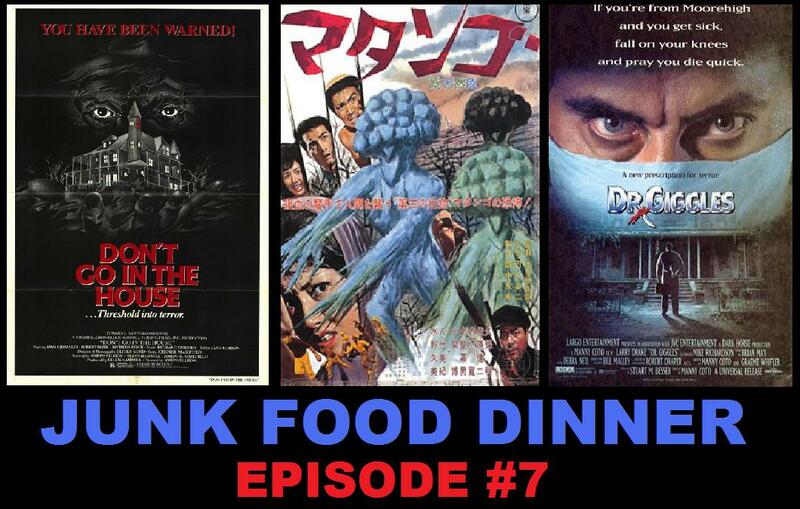 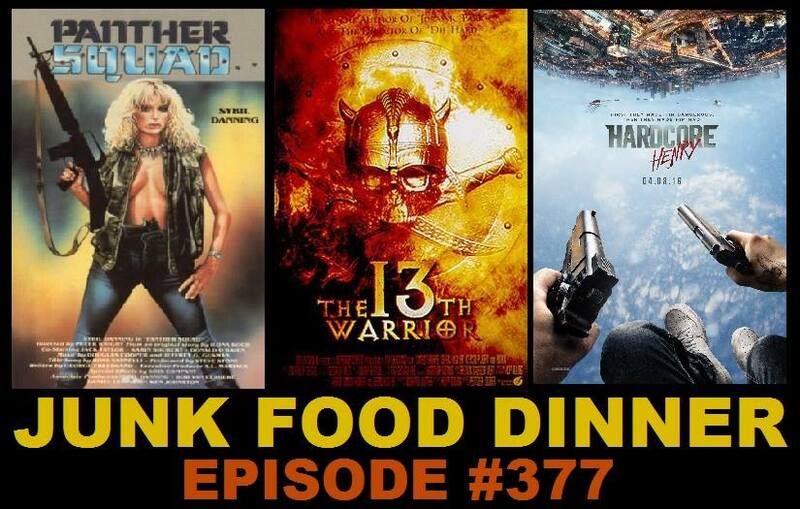 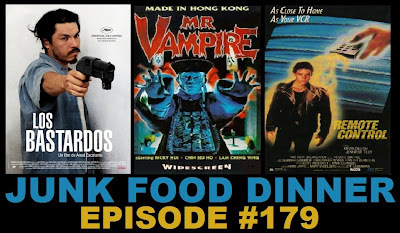 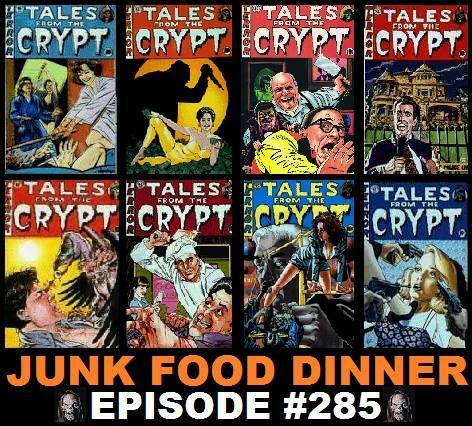 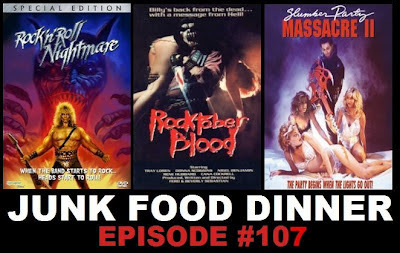 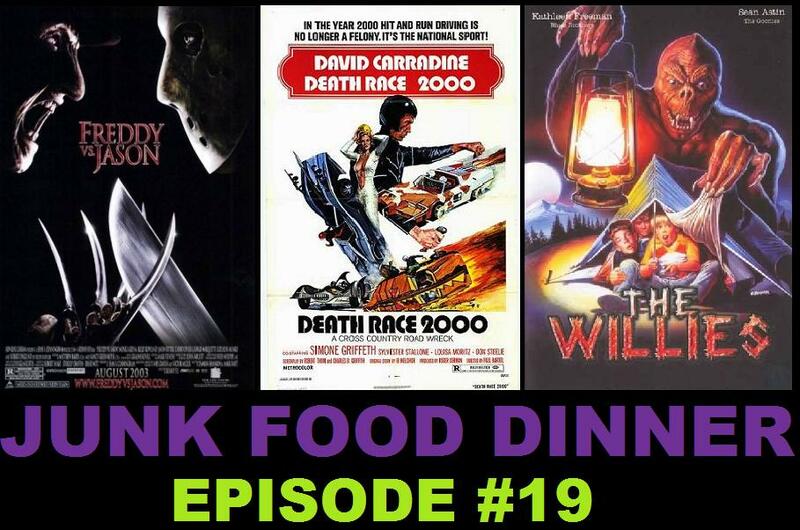 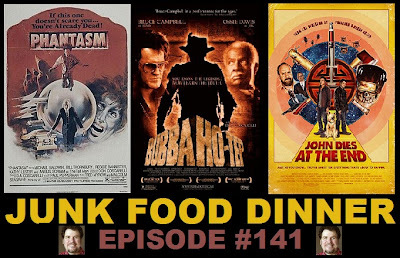 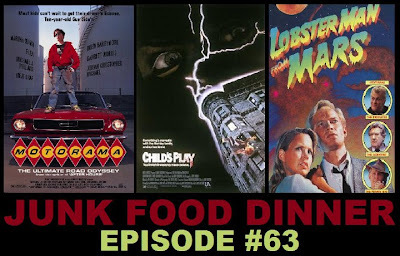 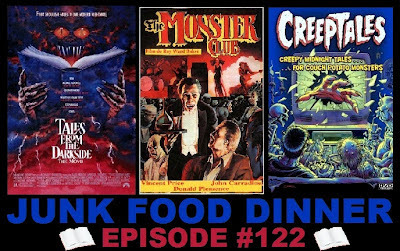 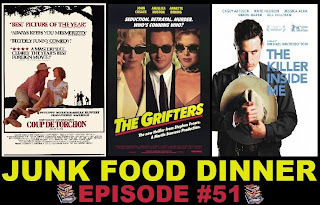 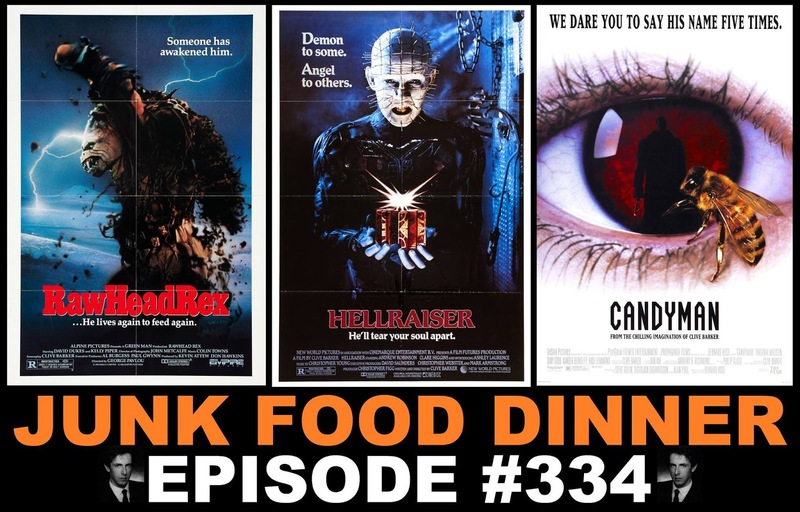 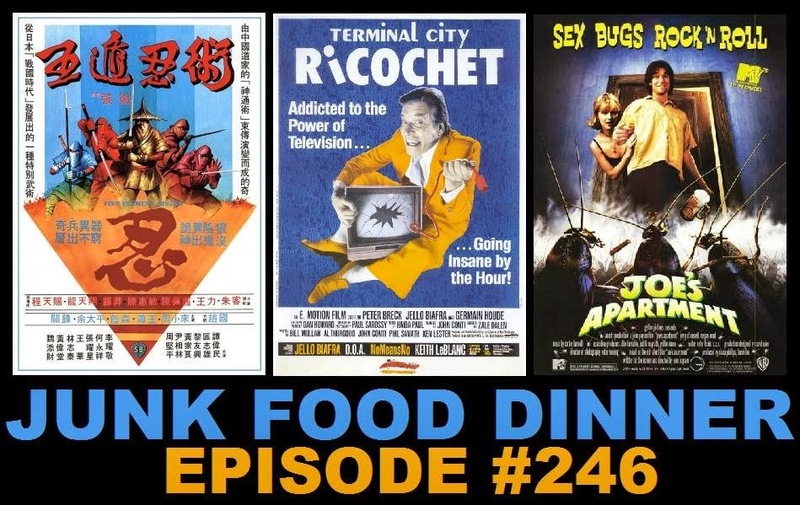 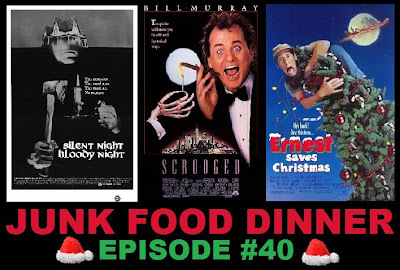 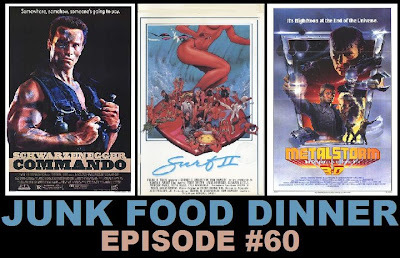 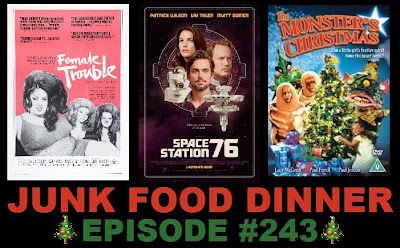 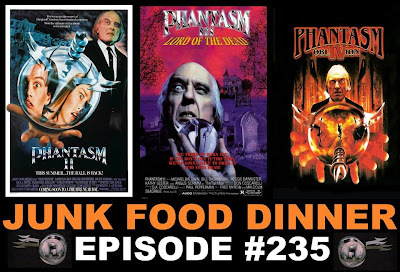 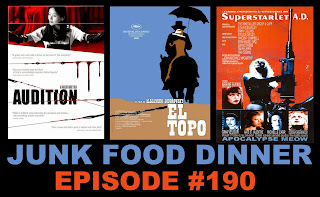 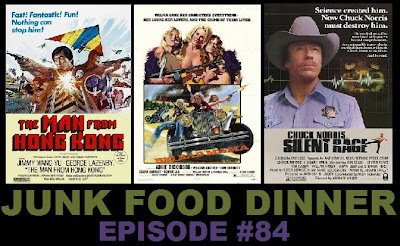 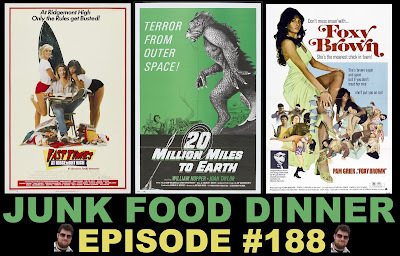 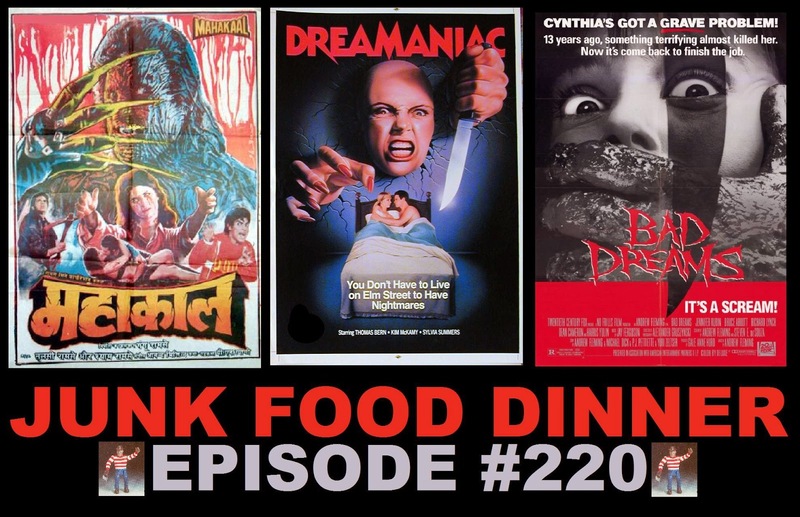 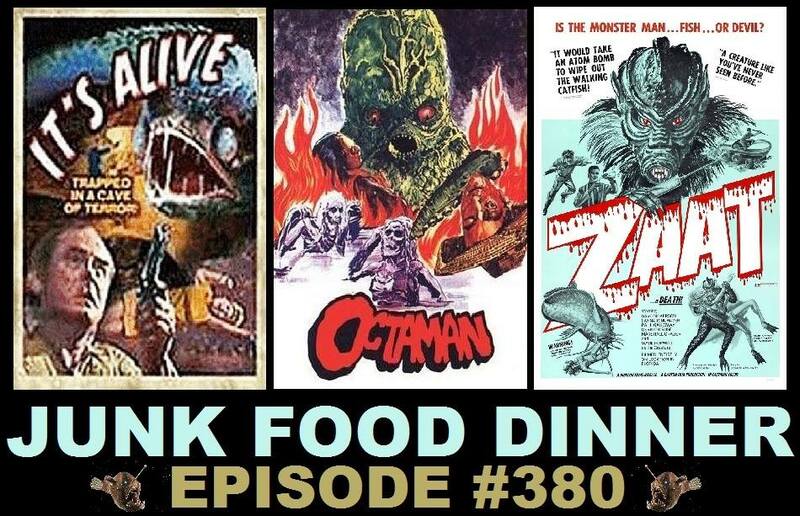 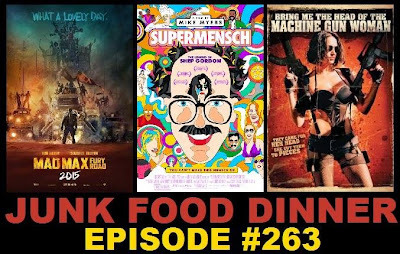 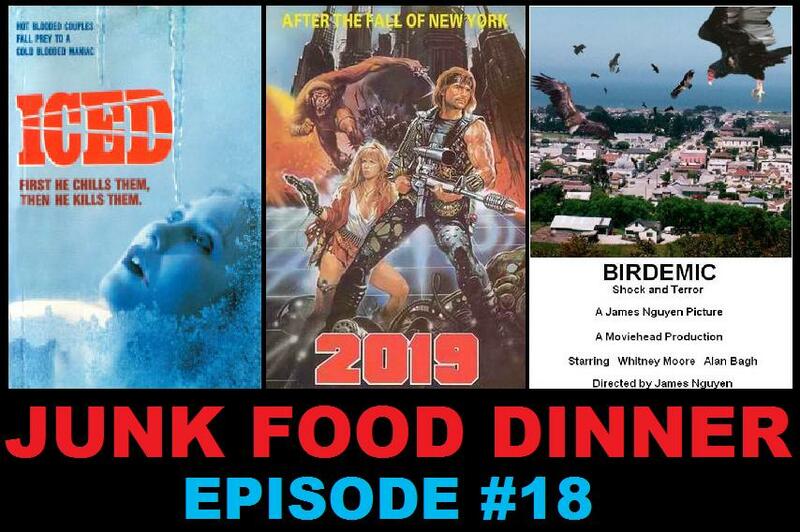 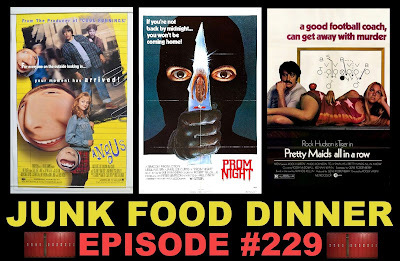 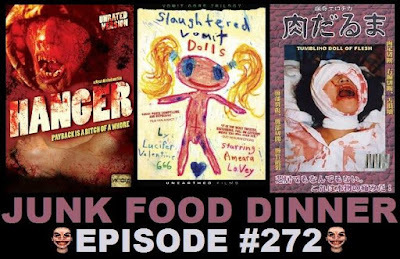 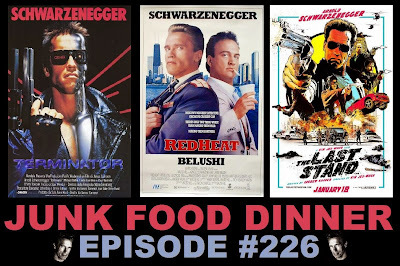 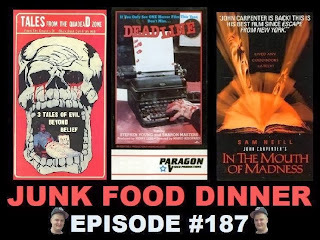 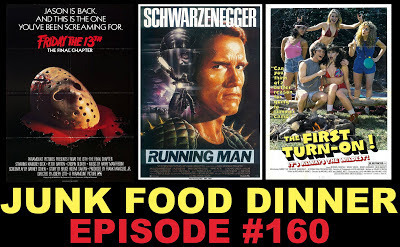 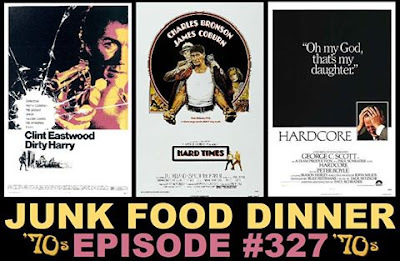 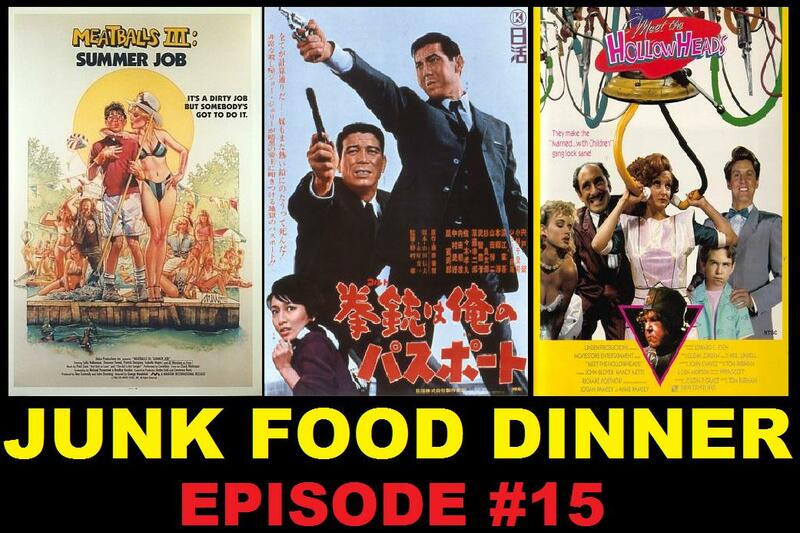 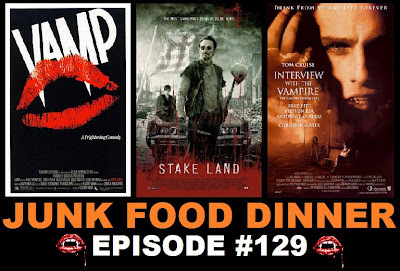 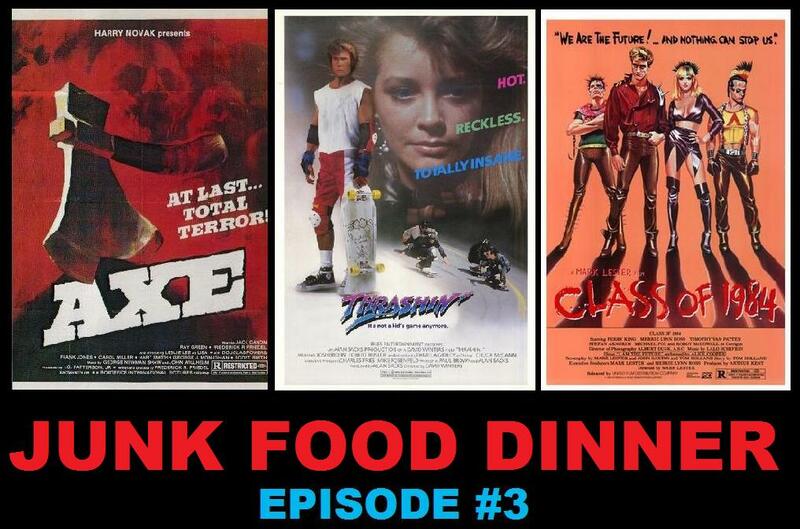 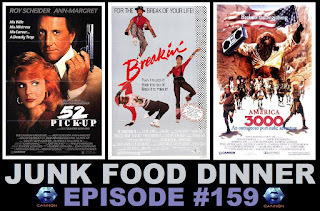 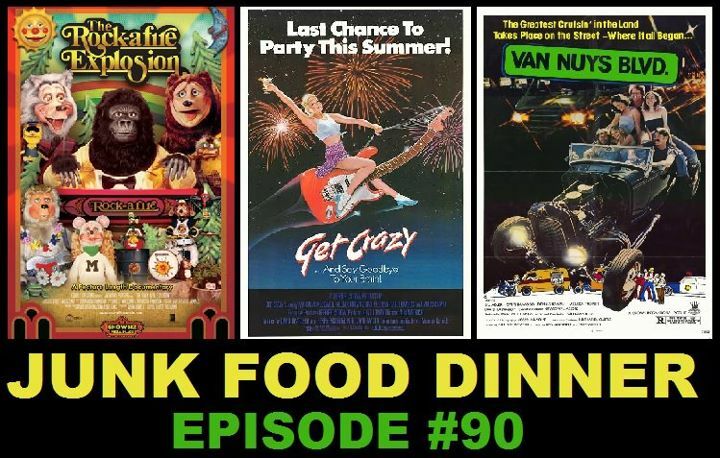 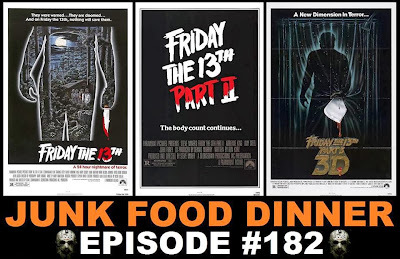 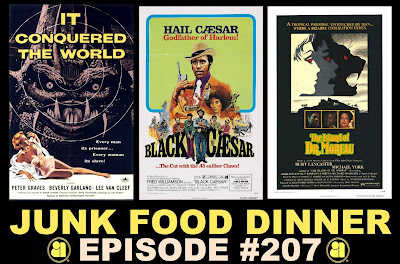 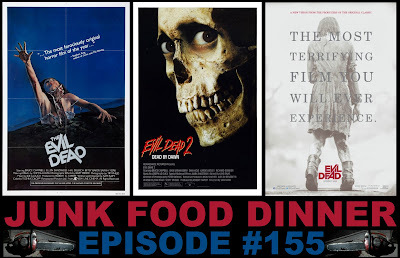 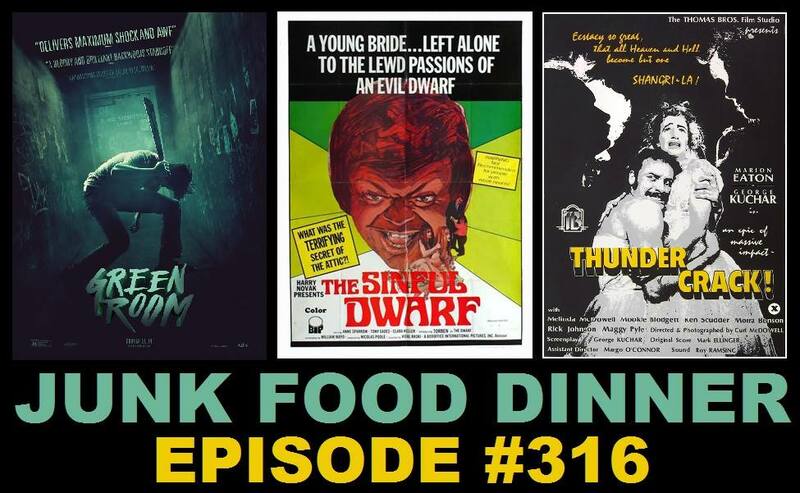 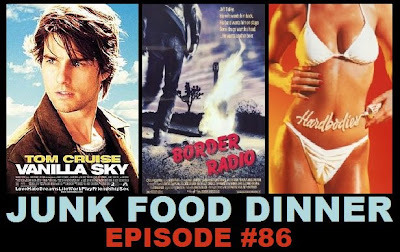 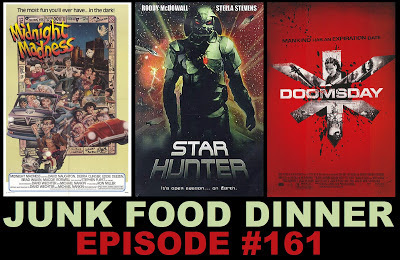 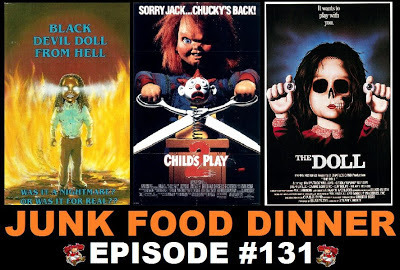 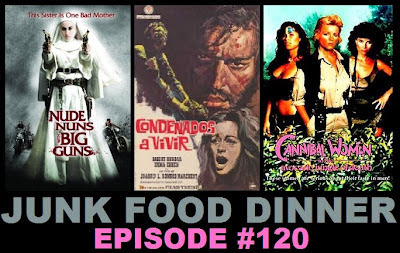 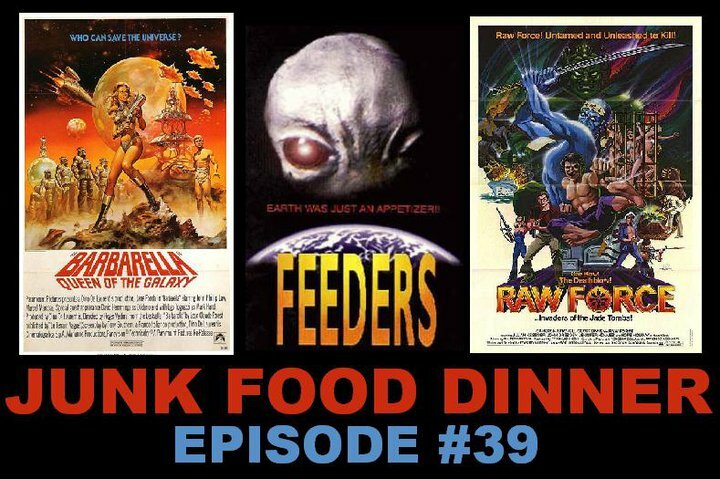 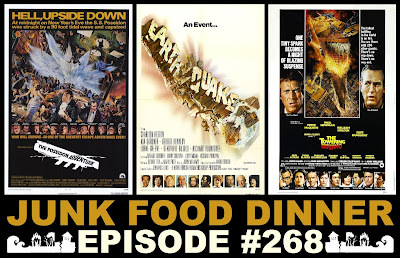 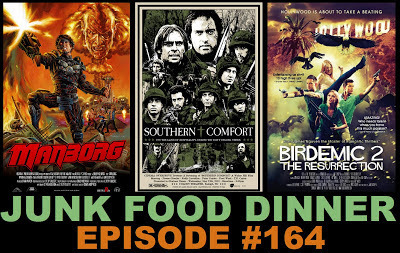 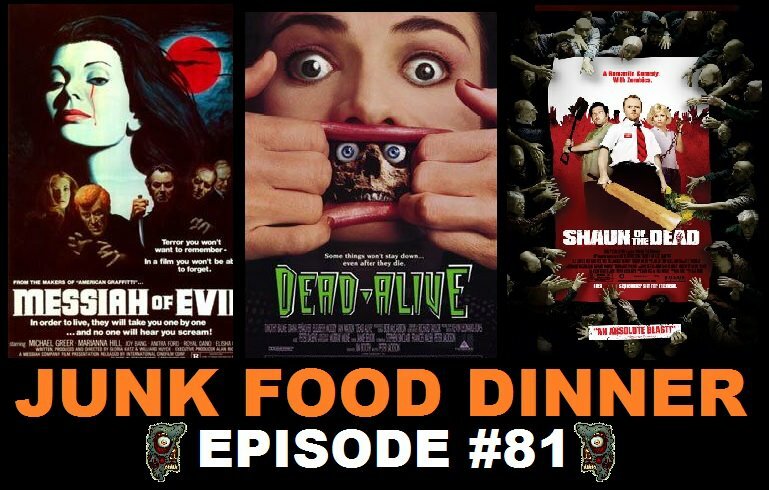 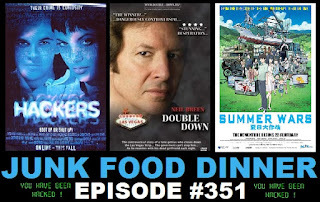 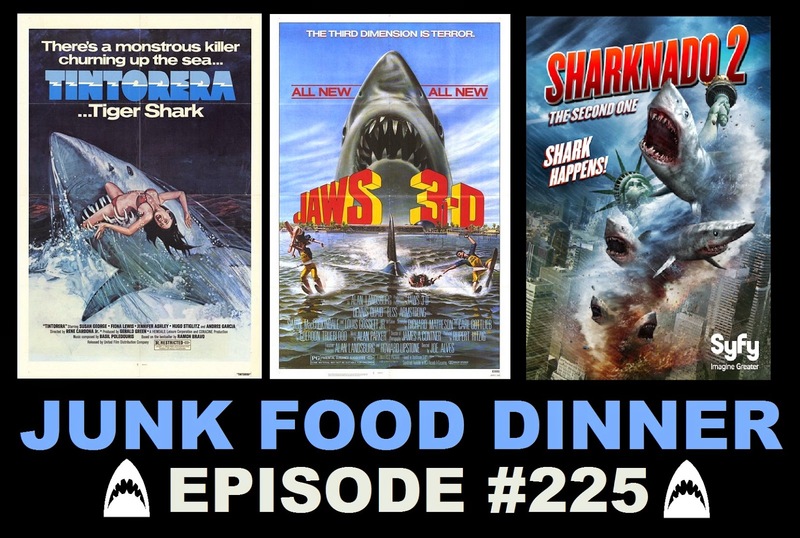 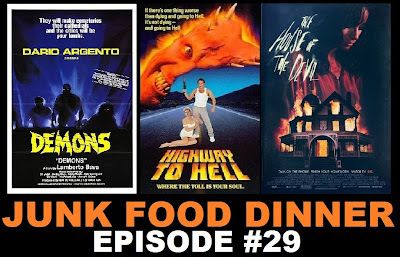 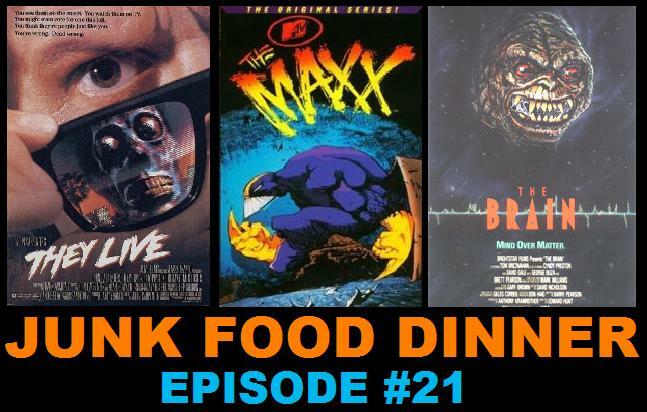 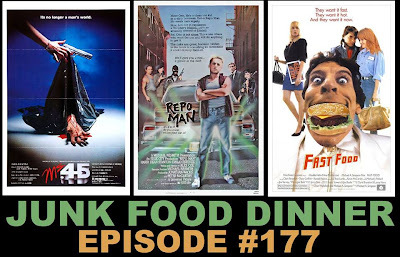 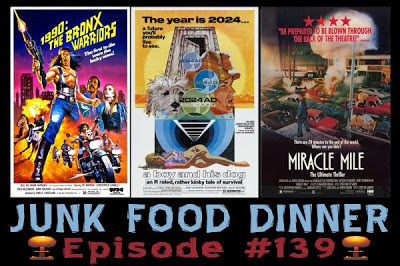 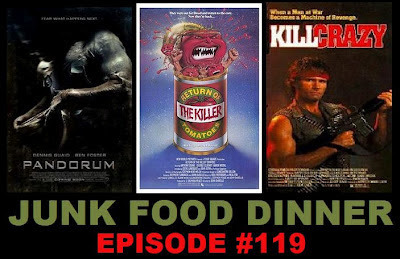 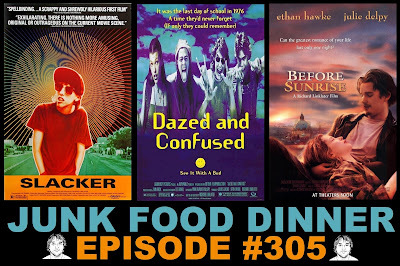 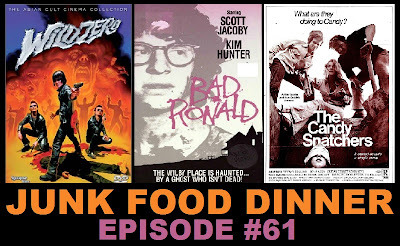 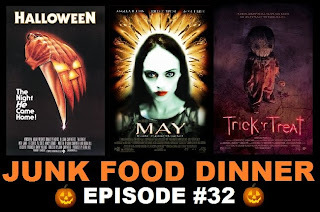 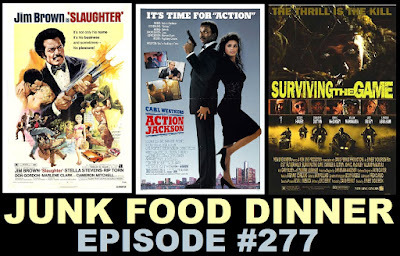 This is a punchy opening sentence pertaining to the 71st episode of Junk Food Dinner! 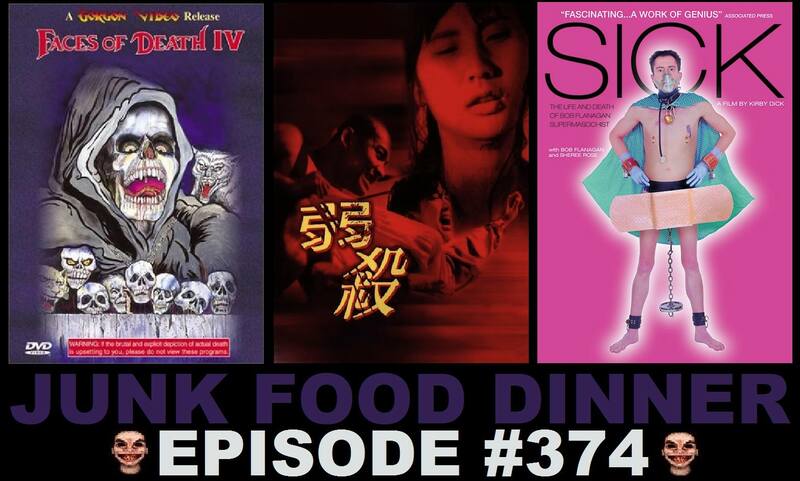 From aliens to the undead to school girls fighting dragons we've got quite a spread lined up this week! 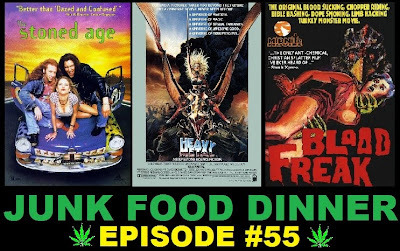 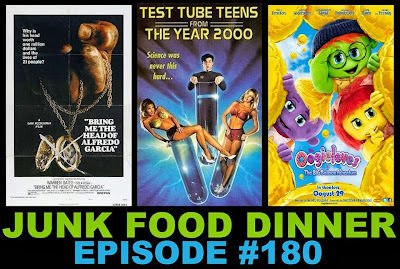 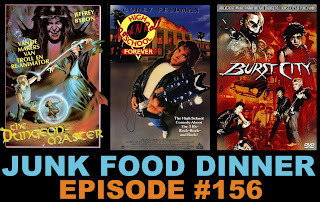 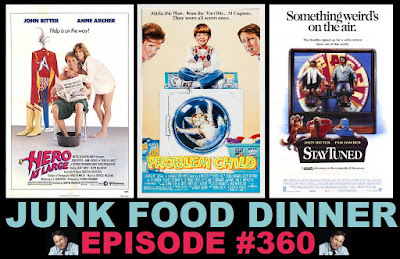 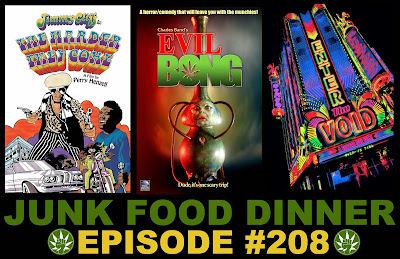 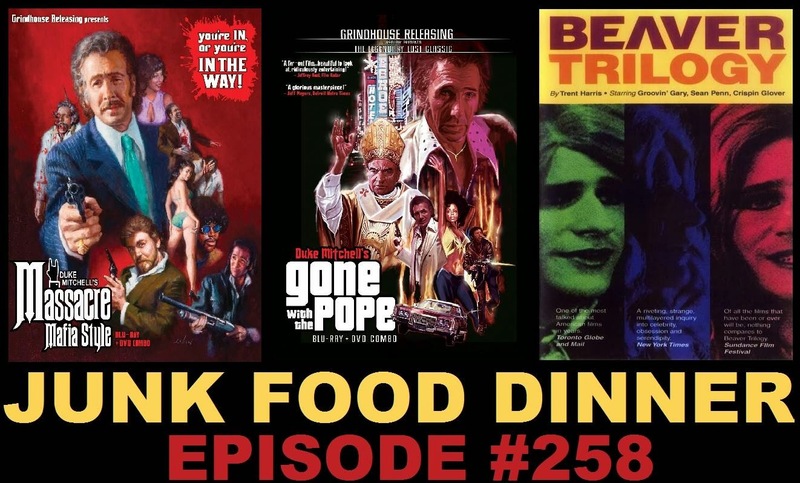 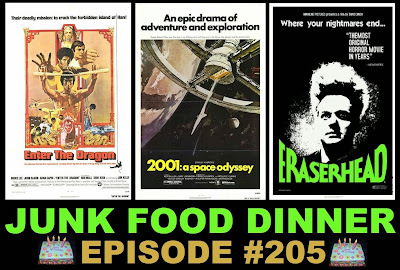 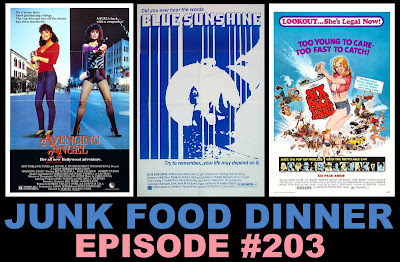 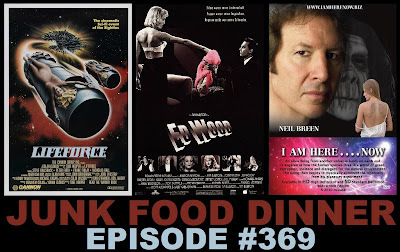 We kick things off with teens in the 70's (via the 50's) in a movie born of the 80's neon bosom! 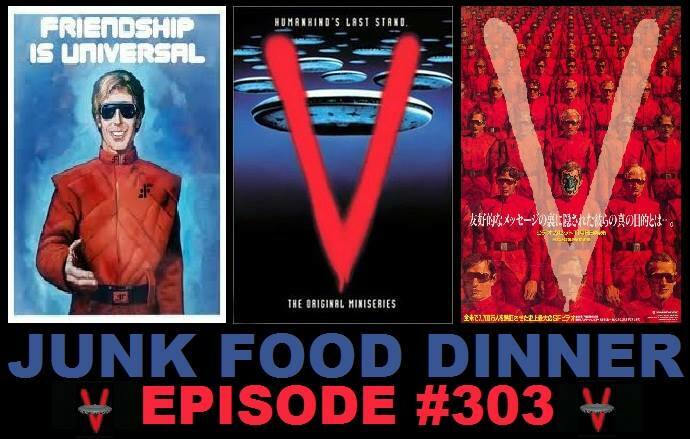 A guitar shaped spaceship and it's crew of new wave alien hipsters invade Earth to win the hearts, minds, and ears of the youth; but first they have to go up against the toughest (and only?) 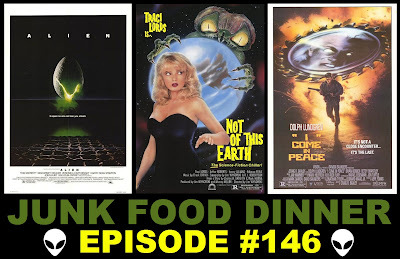 band in town in "Voyage of the Rock Aliens" from 1984 staring Pia Zadora. 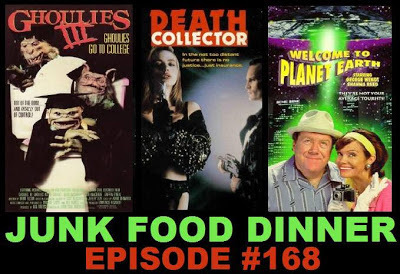 Next, Local sheriff Dan Gillis is in over his head when a string of bizarre murders rocks his sleepy little corner of the world. 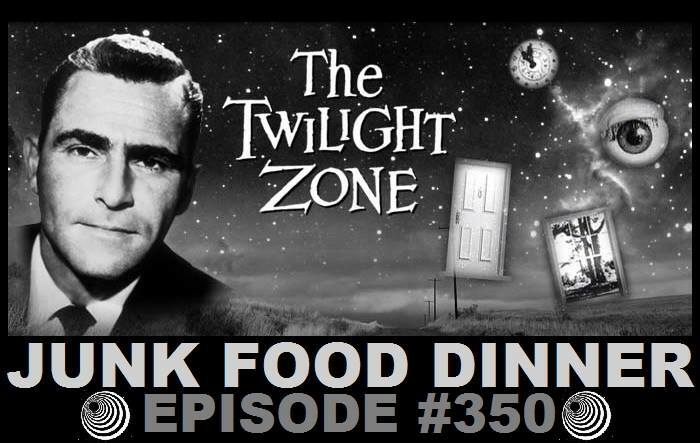 Everyone seems to be acting strange and instead of answers, he's only getting more questions. 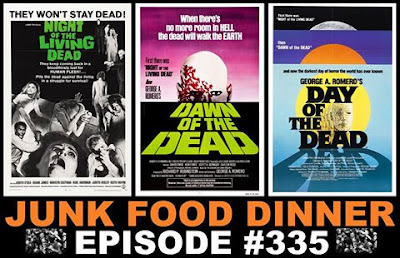 Join us as we learn it takes a village to raise the dead (#jokes)! 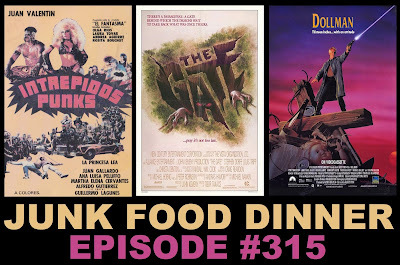 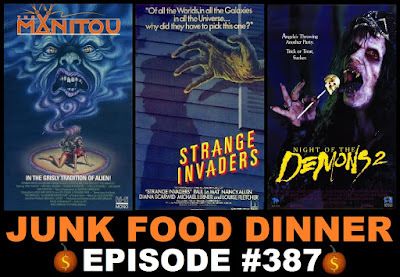 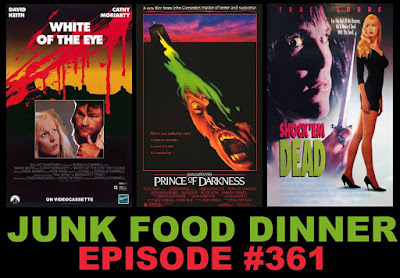 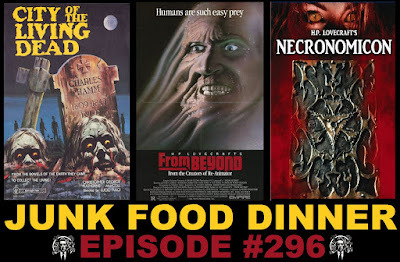 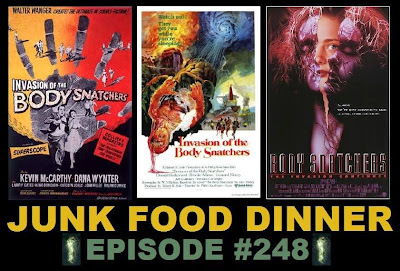 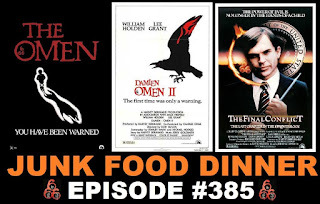 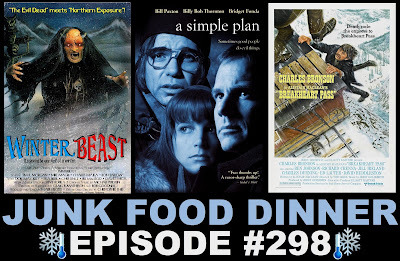 Dan O' Bannon again teams up with Ronald Shusett to craft a spellbinding tale of black magic and betrayal with special effects from Stan Winston in Gary Sherman's "Dead & Buried" from 1981. 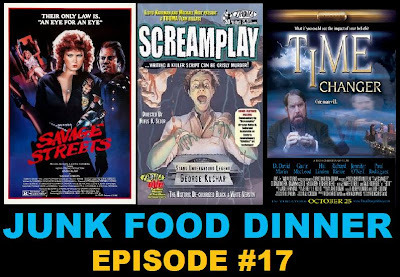 Finally, escape is the only option as we get wrapped up in dreams within dreams and go head to head with evil doctors, orcs, dragons, and more. 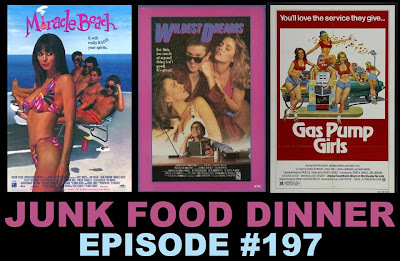 Baby Doll and her friends are busting out - but not without a plan! 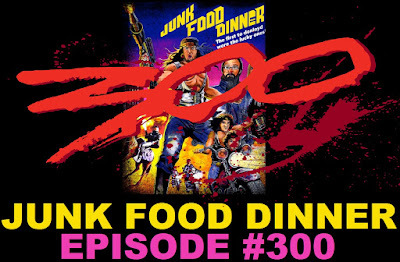 When the music starts, reality ends. 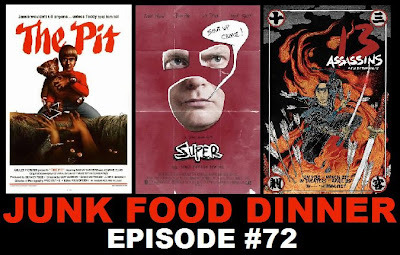 The stage is set for Zack Snyder's first original work, "Sucker Punch" from 2011. 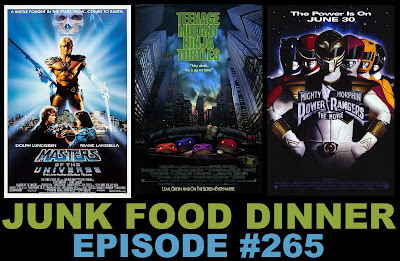 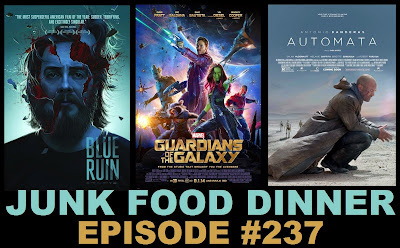 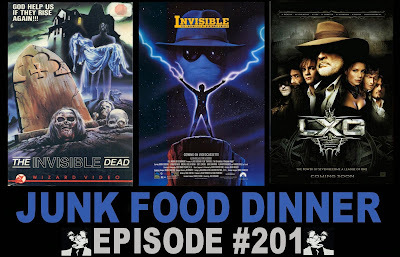 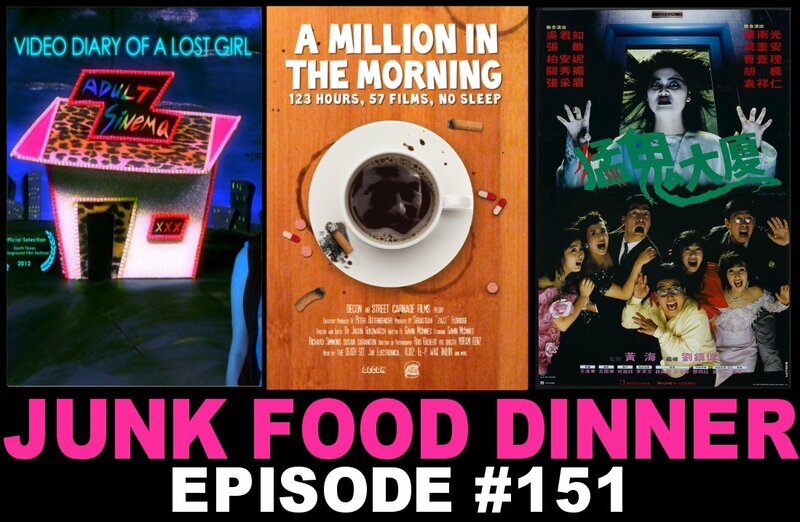 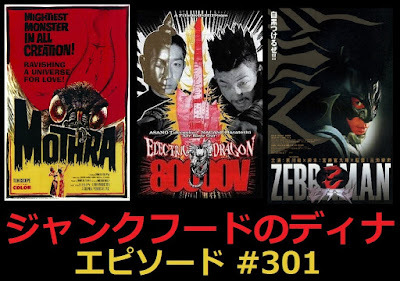 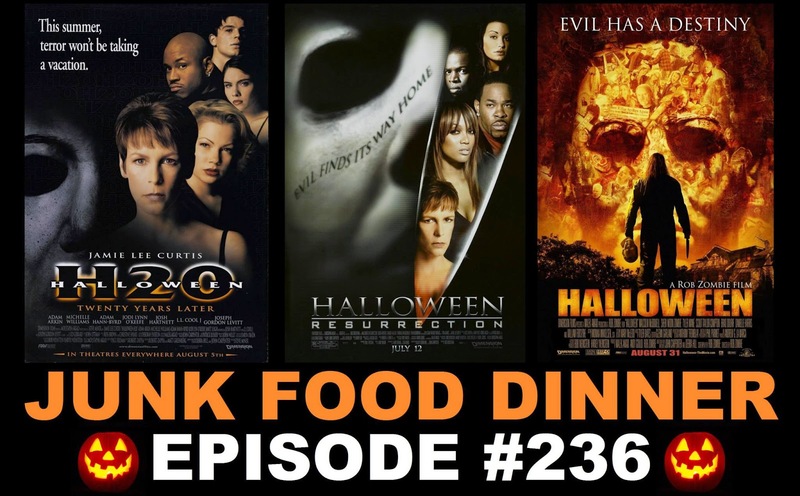 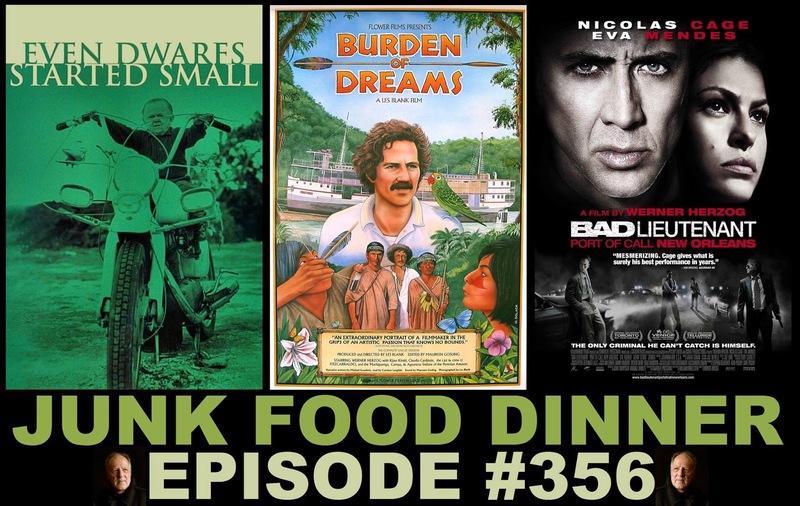 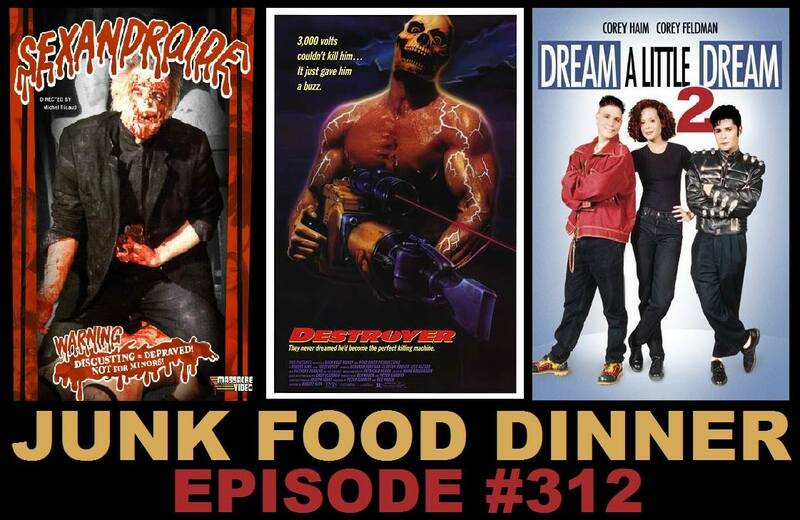 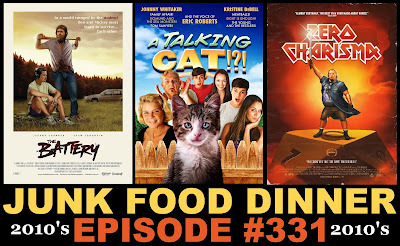 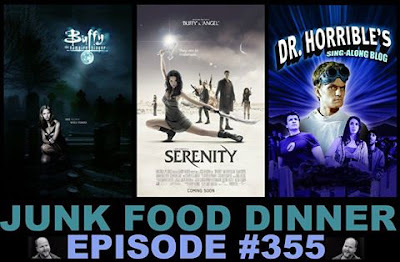 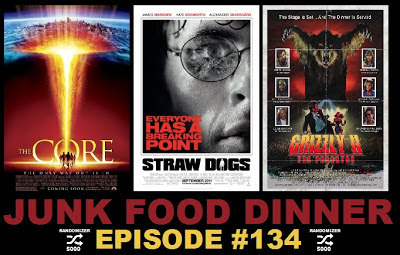 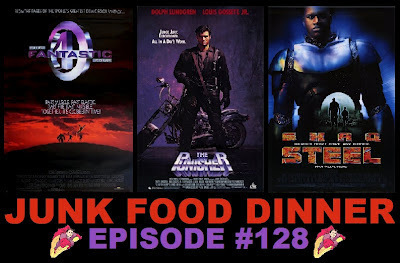 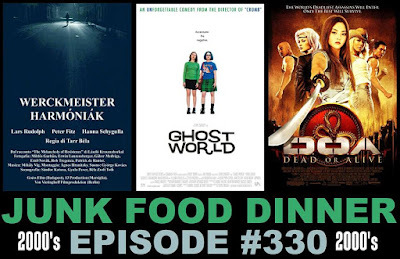 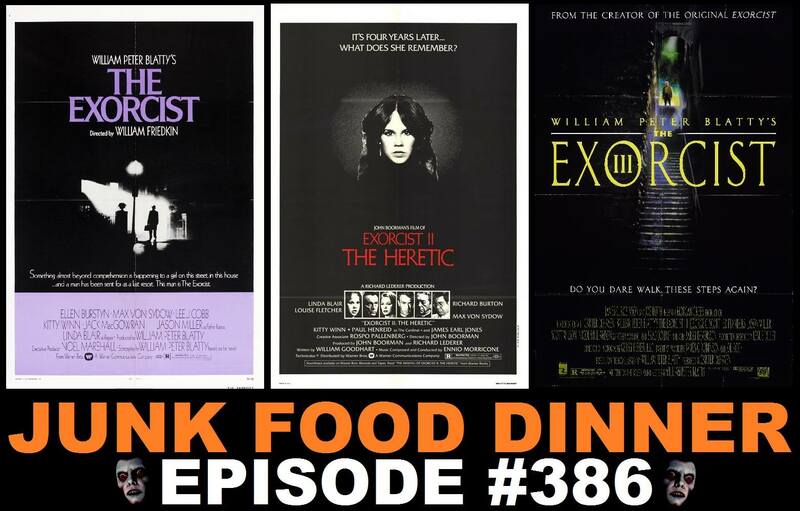 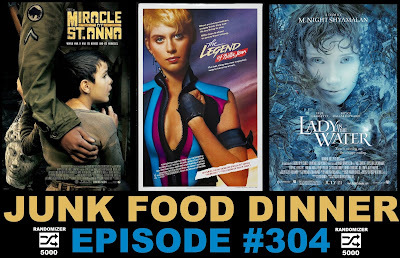 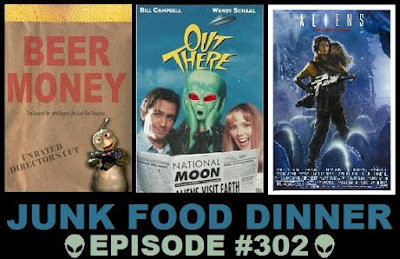 All this plus witty banter between friends, listener feedback, Nerd News, DVD releases, and more!